We’ve arrived in London after a long day traveling. We took off from Indianapolis International Airport Monday evening around 7:30PM for Dallas-Fort Worth. There we boarded a 767 for a bumpy nine hour flight to London’s Heathrow Airport. We arrived at 1:45 PM on Tuesday. We hopped on the London Underground for the hour-long, 23-stop train ride to King’s Cross Station, getting to our hotel finally around 4:00 PM Tuesday. We paused at the hotel only briefly before walking a short distance to the British Library, the largest in the world. 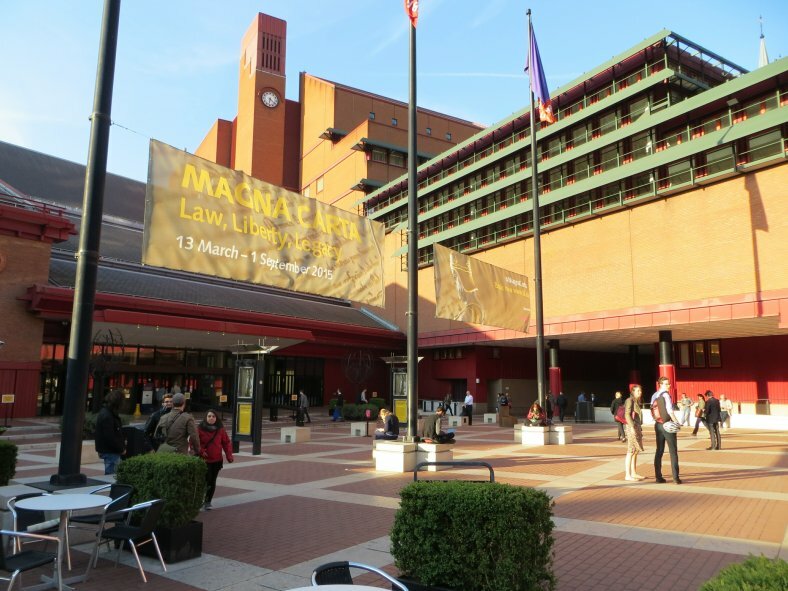 Two of the original four 1215 AD Magna Carta documents are part of a special exhibition. Also on display is an original copy of the U.S. Bill of Rights and Thomas Jefferson’s handwritten copy of the Declaration of Independence. Why would these latter two documents be part of the Magna Carta exhibition I wonder? Sorry, no photography allowed. Afterwards, we walked next door to get back on the Underground. Before heading to the theatre, we stopped to grab a quick snack. 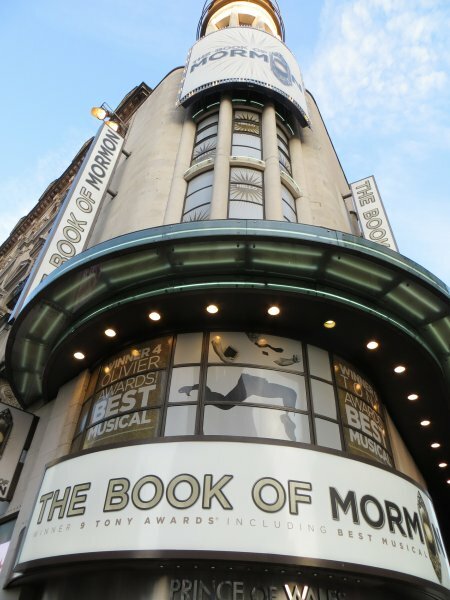 Then it was across the street to the Prince of Wales Theater to see the multiple Tony Award winning The Book of Mormon. Hysterically funny! We’re so tired. It’s off to sleep now. Today we were taken all over Central London by train, bus, boat and wheel. 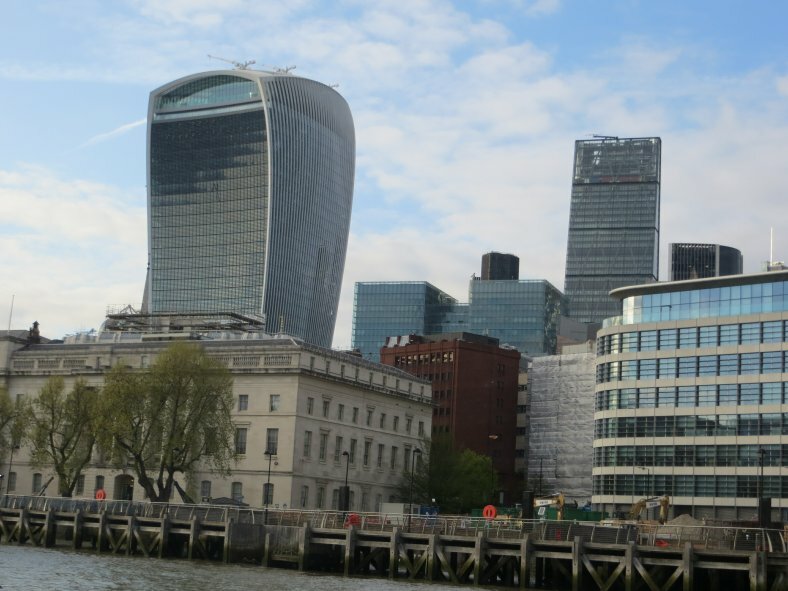 After a quick underground train ride, we walked to 20 Fenchurch Street to the building nicknamed the Walkie Talkie. 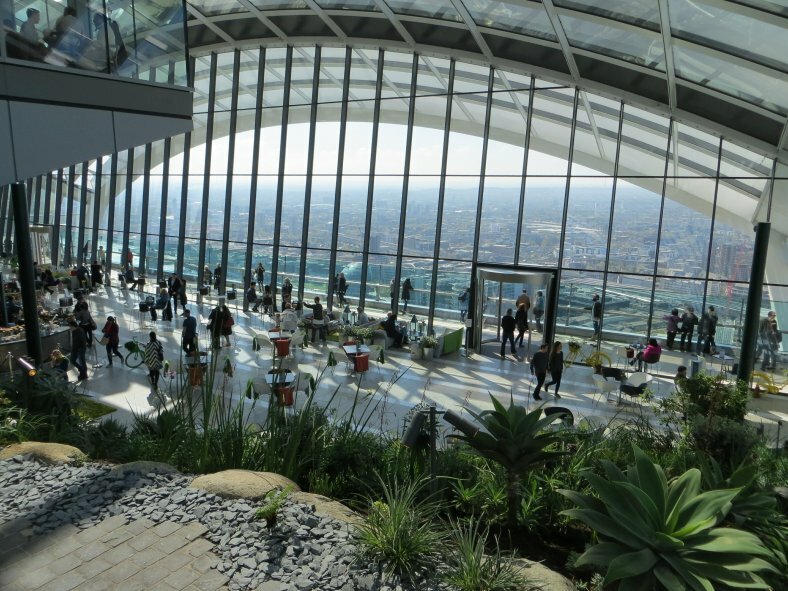 Because London requires builders to create new green space if they destroy old green space with new construction, this building has a lovely “Sky Garden” on the top three floors. It’s a really unique place. 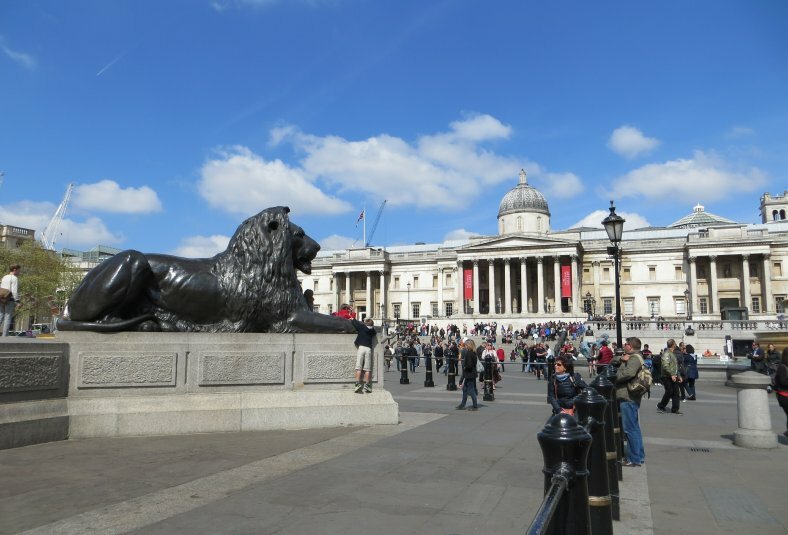 Then it was off to Trafalgar Square to catch a two-hour hop-on-hop-off bus around the city. 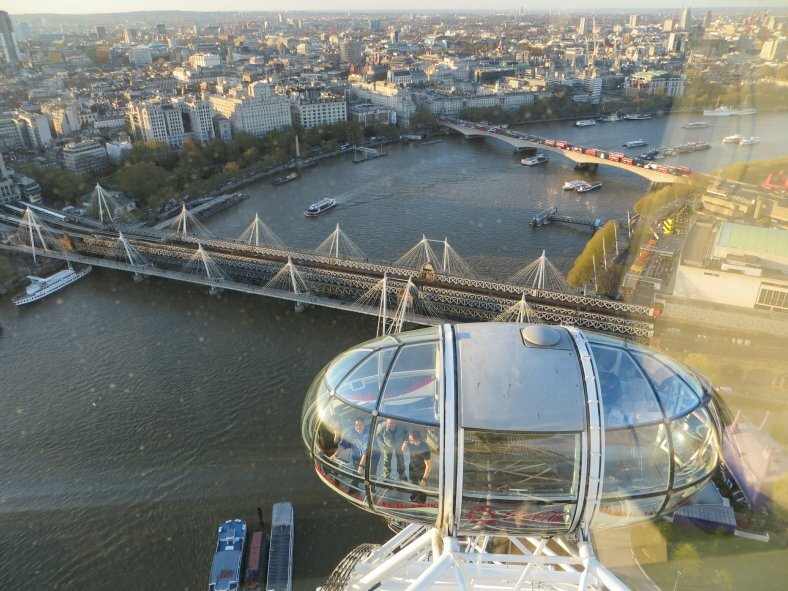 This was followed by a two-hour cruise along the river Thames. 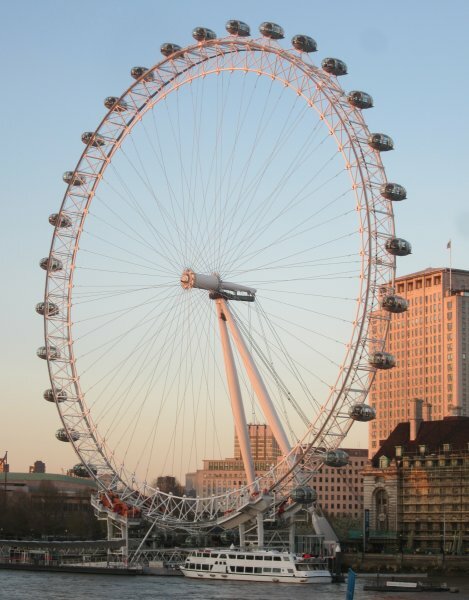 From where the boat docked at Westminster Pier, it was only a short walk across Westminster Bridge to the London Eye. This last picture of the of the Palace of Westminster brings up today’s trivia question, what is Big Ben? The answer to yesterday’s question about why copies of the U.S. Declaration of Independence and Bill of Rights were included in the Magna Carta exhibit is because our founding documents were inspired by the Magna Carta. 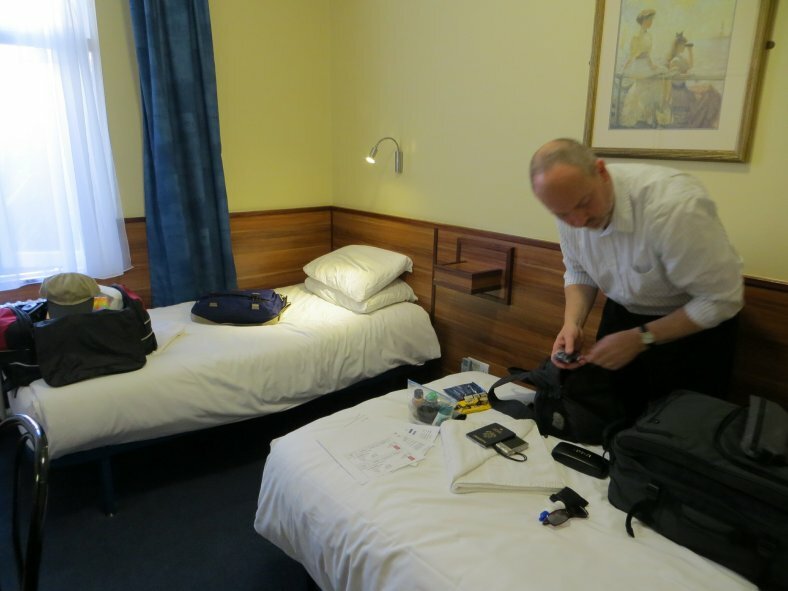 We're staying in a really tiny room at the Crestfield Hotel near Kings Cross. More lengthy journals to come when we get some sleep. It’s midnight here. Goodnight! The video below is 43 minutes long of Dan & Kevin's day in London. We arrived in Paris on a gorgeous sunny Thursday afternoon around 3:45pm local time. We left London at noon on the Eurostar train, which as you probably know, travels under the English Channel. This train journey was so smooth and comfortable compared to flying. Plus it only takes about 2 ½ hours as it reaches a speed of 186mph (300 km/hour). 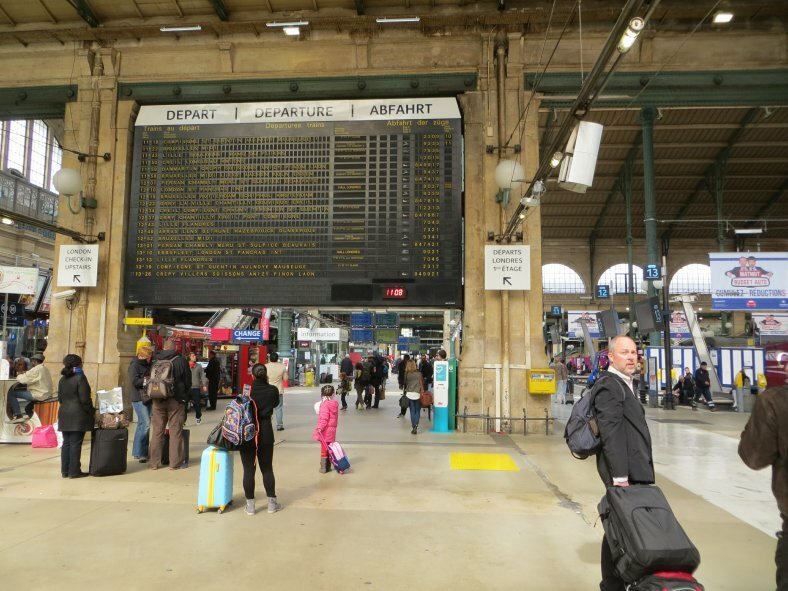 Thankfully the docent at the tourist information booth in Gare de Nord train station spoke fluent English. 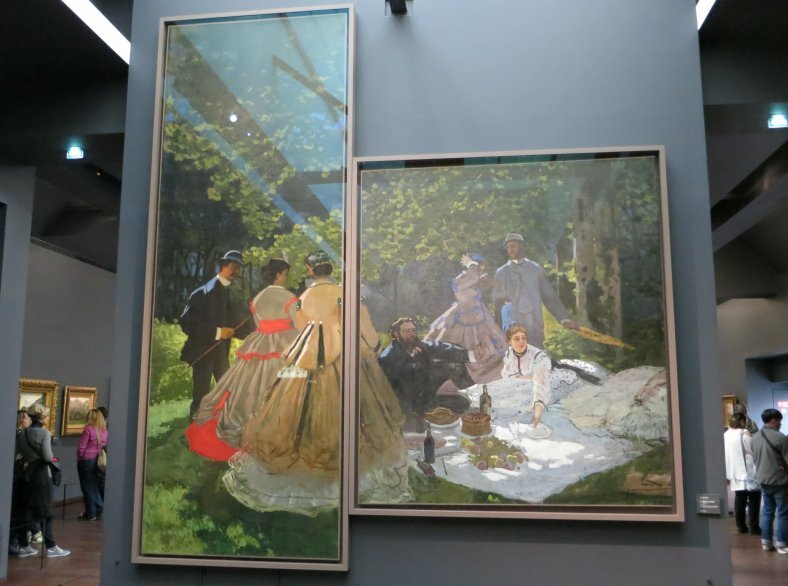 We easily purchased our metro tickets and museum passes for our six-night stay in Paris. 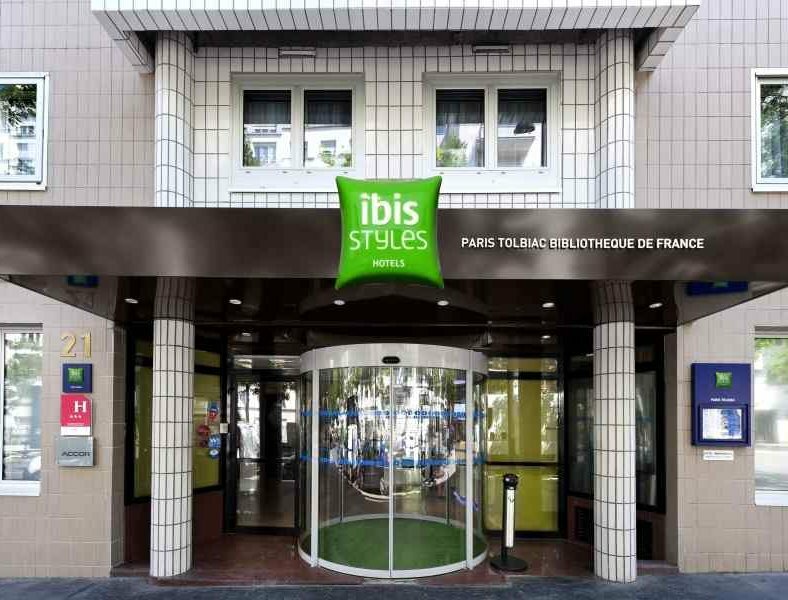 So we hopped on the metro in the station underground and had a quick journey over to our Hotel Ibis Styles Tolbiac Bibliotheque. 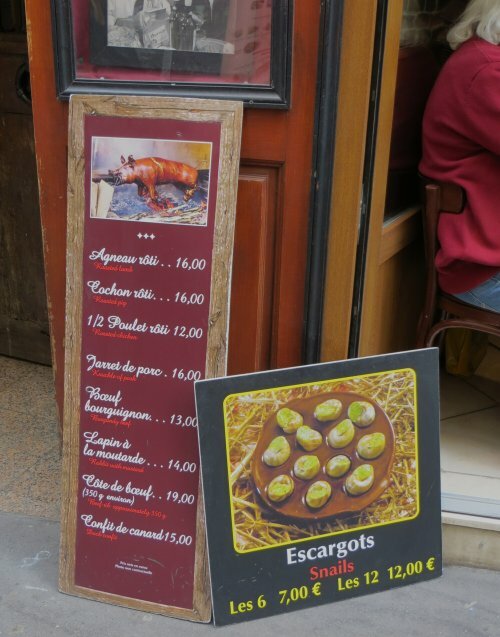 With very little time before our reservations to ascend the Eiffel Tower, we quickly walked over to a nearby Monoprix (similar to a super Kmart). We bought a bag of apples and ingredients to make ham and swiss cheese sandwiches back in our hotel. The double-decker RER C line train took us to the Eiffel Tower. Having reserved tickets, we proceeded directly to the security line. It still took nearly an hour to move through security, then another line to take the elevator up to the first level, then another long, slow moving line to take us to the summit. It certainly was worth the wait. 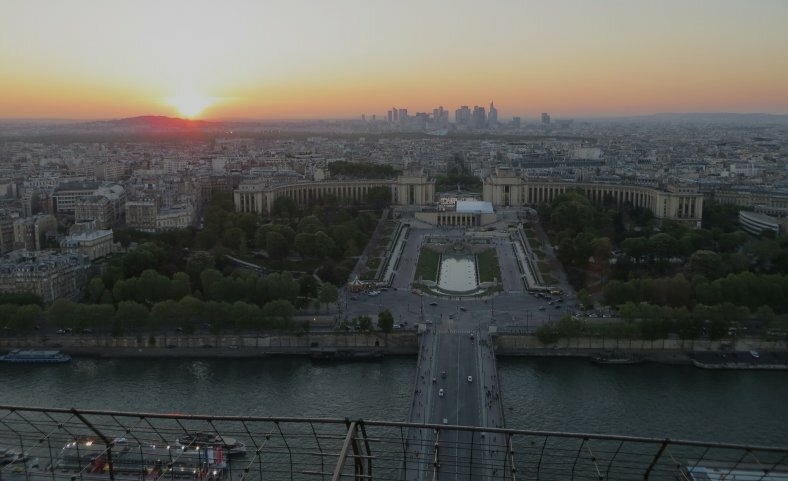 The views were gorgeous and we spent an hour moving to each side of the Eiffel taking pictures and videos. 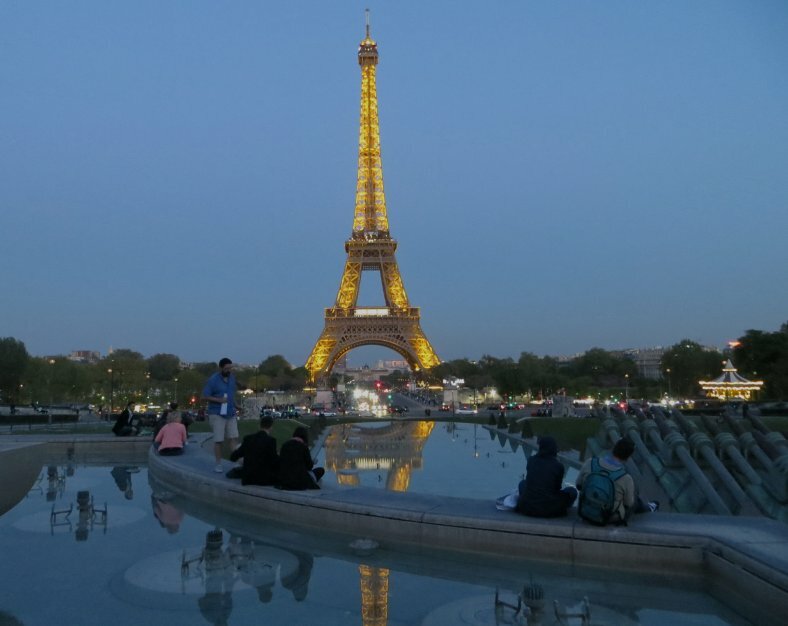 Upon descent, we walked over to the Trocadero to view the tower after dark. Today’s question: Gustave Eiffel was hired to erect the world’s tallest building when completed (doubling the height of the tallest structure at the time – the Washington Monument). For what occasion was this constructed? There was one perfect answer to last night’s question. 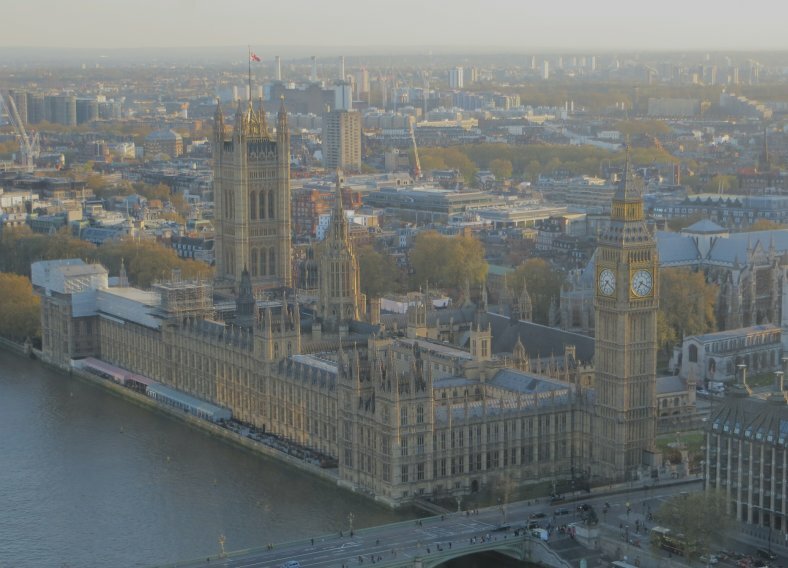 Big Ben is the largest bell in the Palace of Westminster clock tower, not the tower itself. Don’t worry, more to come. Wow! It was another absolutely gorgeous day in Paris. Being the good little Baptists that we are, we started the day by going to church. Not just any church – Notre Dame. There’s been a church on this site since 52 AD. We toured the inside of the current cathedral with a little help from Rick Steves’ podcast tours. Unlike many churches across Europe, this cathedral is alive with both tourists and the faithful alike. 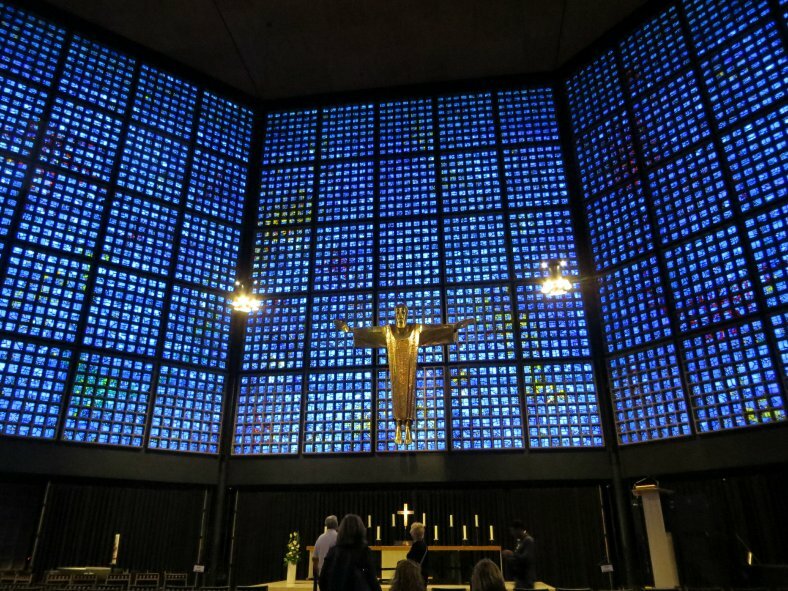 As tourists silently made their way around, confessions were being heard, prayers were being whispered in numerous chapels, and a mass took place right at noon. After taking many pictures and videos (which you soon will be able to see on my brother’s Hoosier Tim Travel Videos on YouTube), we made our way outside to view the exterior gargoyles and flying buttresses. Well enough church, let’s move on. We walked across a little bridge over the Seine, Pont de l'Archevêché. 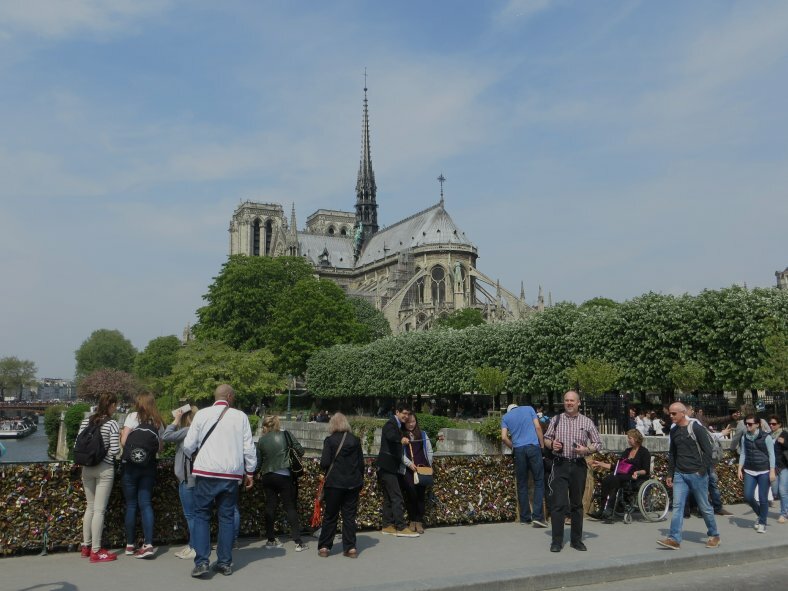 Every square inch of space along its sides is covered with padlocks. Tradition has it that lovers can guarantee their love will last forever by placing a lock here and throwing the key into the Seine. 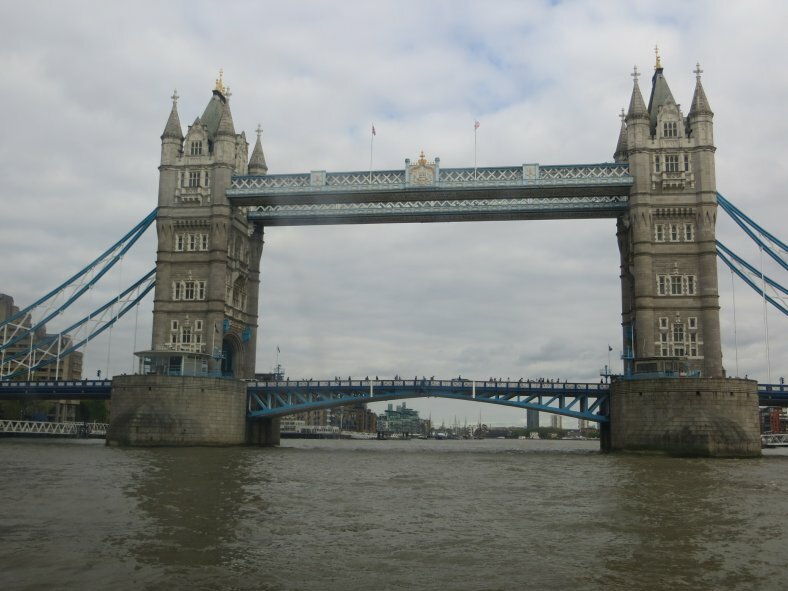 The trouble is the bridge is actually in danger of collapsing due to the extra tonnage of all the locks. Once over the bridge, we strolled through the Latin Quarter. Picturesque France at its best. We wandered back across the Seine to view the magnificent stained glass of Saint Chapelle and to hear the tales of terror still echoing in the Congiergerie from the French Revolution. 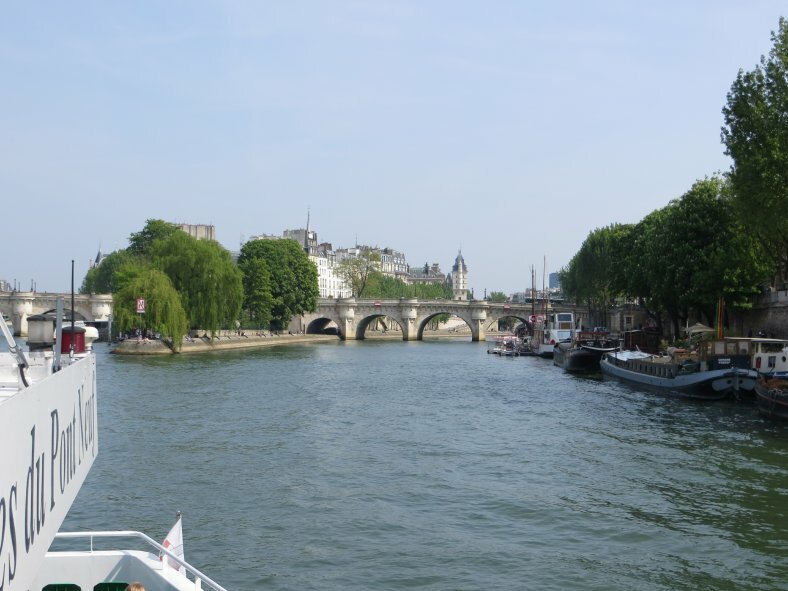 We then took a relaxing river cruise up and down the Seine. 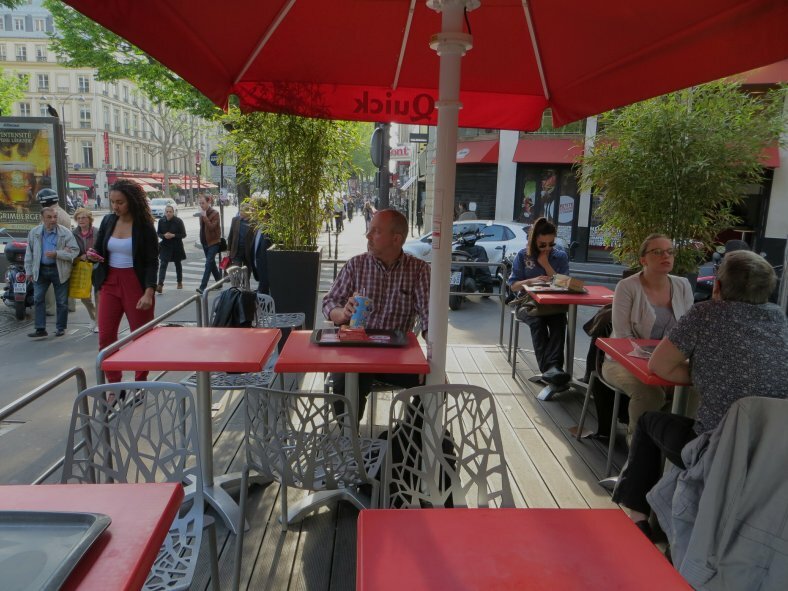 What better way to conclude this lovely day than by having a sidewalk café supper. We even had a coupon! Many correct responses were received from yesterday’s quiz about the Eiffel Tower. The tower was the main exhibit at the 1889 Exposition Universelle (World’s Fair), held to commemorate the centennial of the French Revolution. 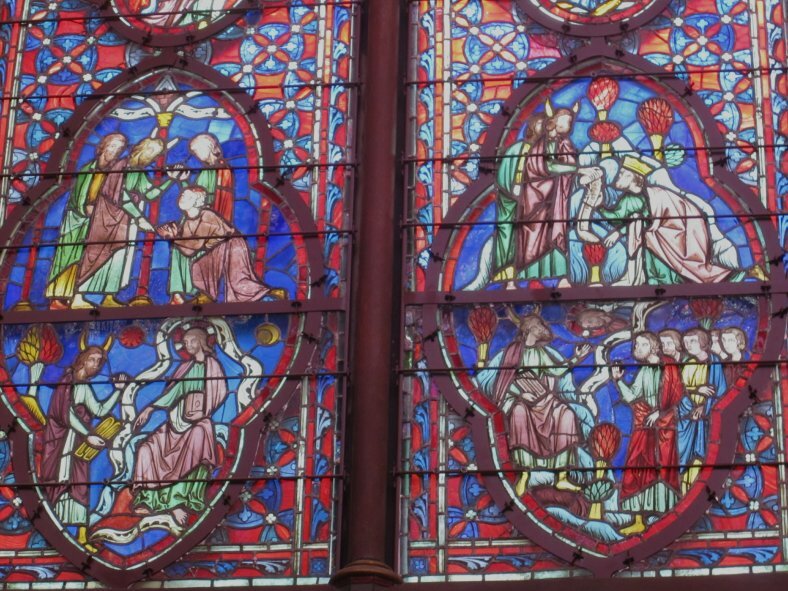 Today’s quiz: Look carefully at the picture below from Sainte Chapelle. What biblical character is portrayed here? And what is he holding? We spent the majority of the day Saturday in Versailles. Here’s what it looked like when we arrived. Oh well, it can’t be gorgeous every day. 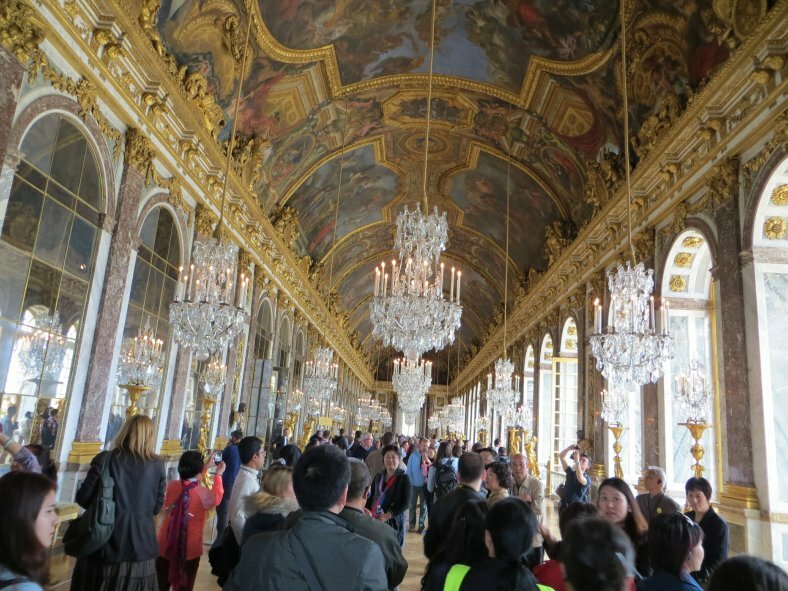 We began by touring the grand palace that King Louis XIV built largely to consolidate his power and create a fully centralized government centered around him. 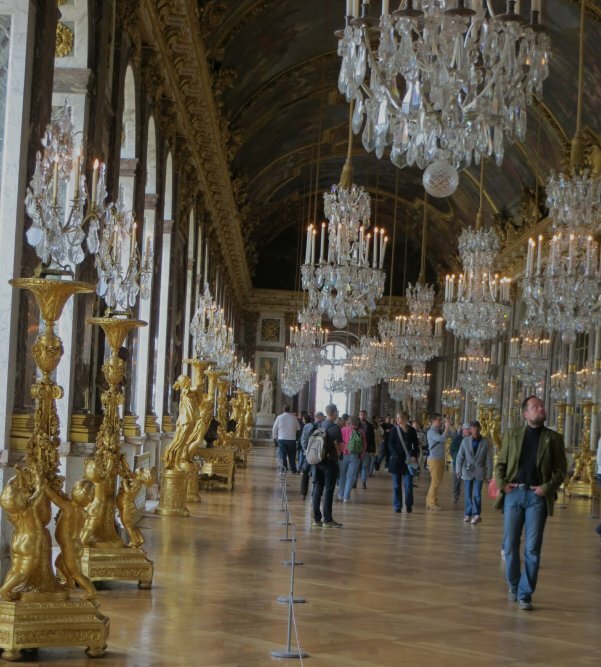 This room, the Hall of Mirrors, was the crowning achievement of the palace. Nothing else like it existed in all of Europe. We continued on through part of the massive gardens. 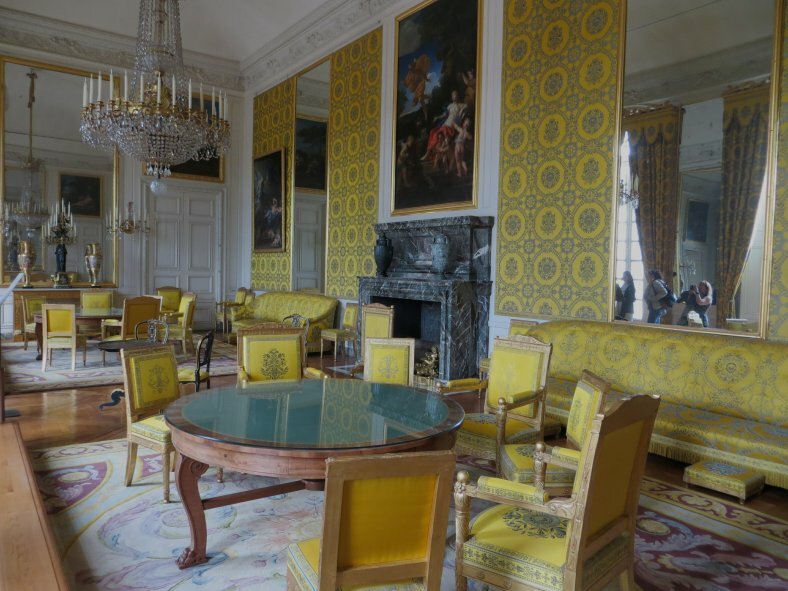 Then we toured the smaller and more intimate Grand Trianon palace used a couple days a week to “get away” from all the pressures of the Grand palace. Life was rough when you were king. 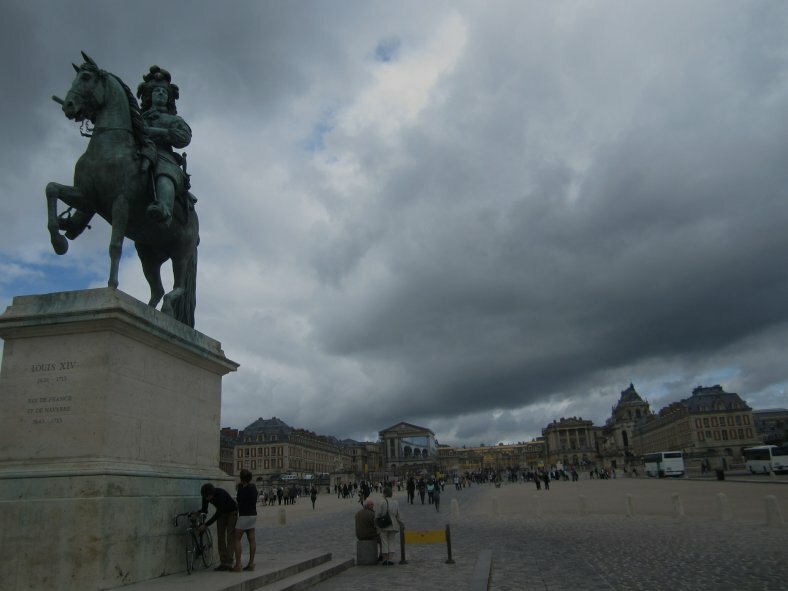 By this time the weather was getting rather ominous, so we headed to the train station for the journey back to Paris. *As the original Hebrew word karan, signifies “to shine out, or dart forth, as horns on the head of an animal, or rays of light reflected from a polished surface”, we may suppose that the heavenly glory which filled the soul of this holy man, darted out from his face, in the manner in which light is generally represented. The Latin Vulgate renders it, 'and he did not know that his face was horned;' which version, misunderstood, has induced painters to represent Moses with two very large horns, one proceeding from each temple! Google Moses and horns and you can read some differing opinions of whether the “horns” are a misinterpretation of Vulgate scripture or not. While touring various places on this trip we’ve happened upon this sign. We don’t recall seeing itback home. Do you know what this is? 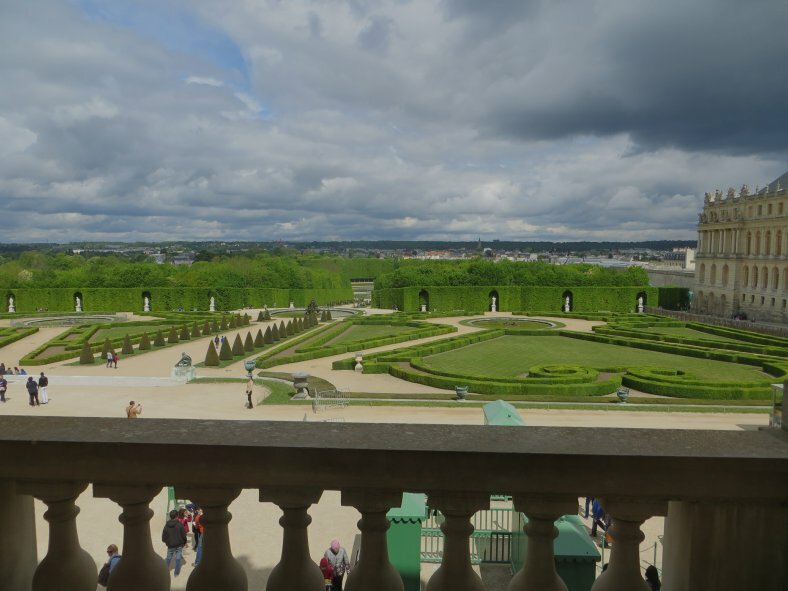 The video below is 11 minutes long of Dan & Kevin's visit to Versailles. Today was a bit damp in Paris. We had to do a bit of rescheduling and made Sunday a museum day. Our first stop was to the former royal palace. 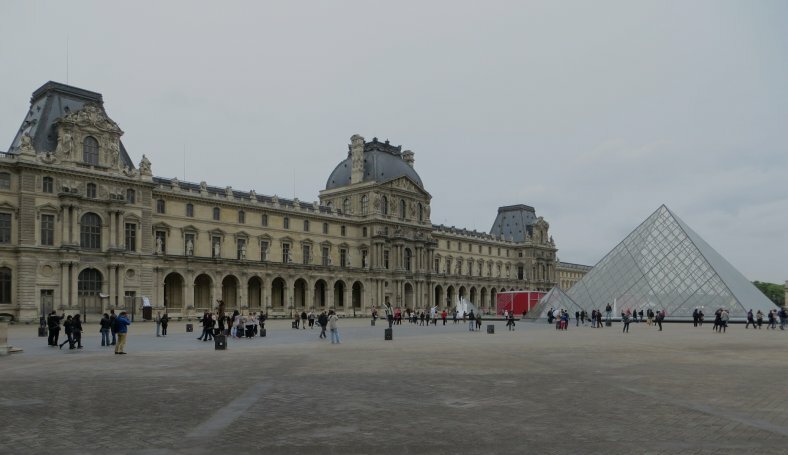 Now it is one of the largest museums in the world and the most visited museum in the world – the Louvre. There were certainly a lot of people here today. 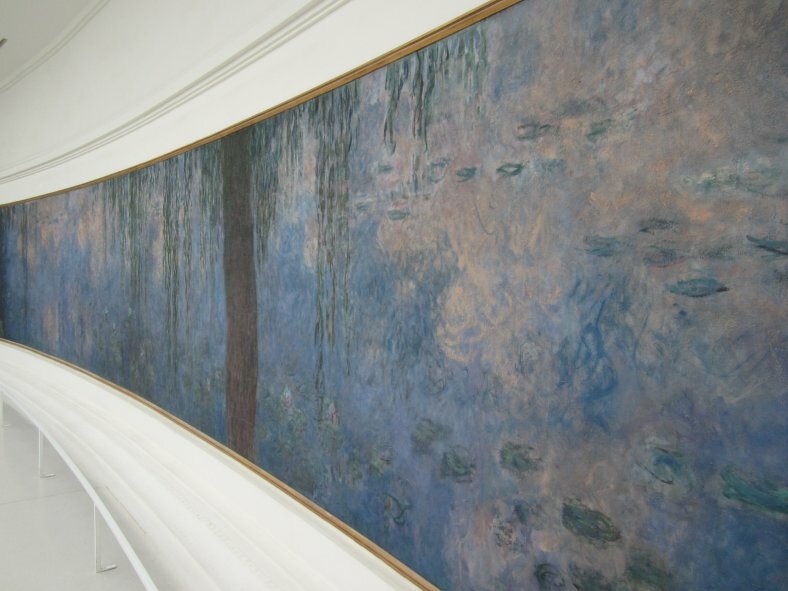 Throngs of visitors surrounded all the world-renowned works of art. One of the first such work’s we saw was the 2 nd century B.C. 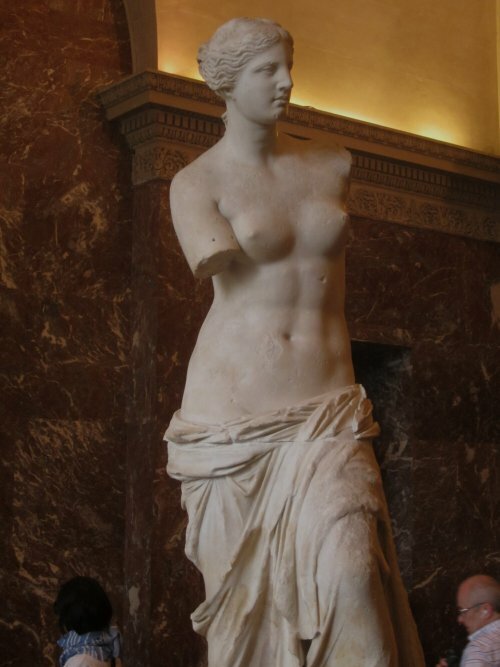 Venus de Milo. You had to work your way through the crowds to get a view. 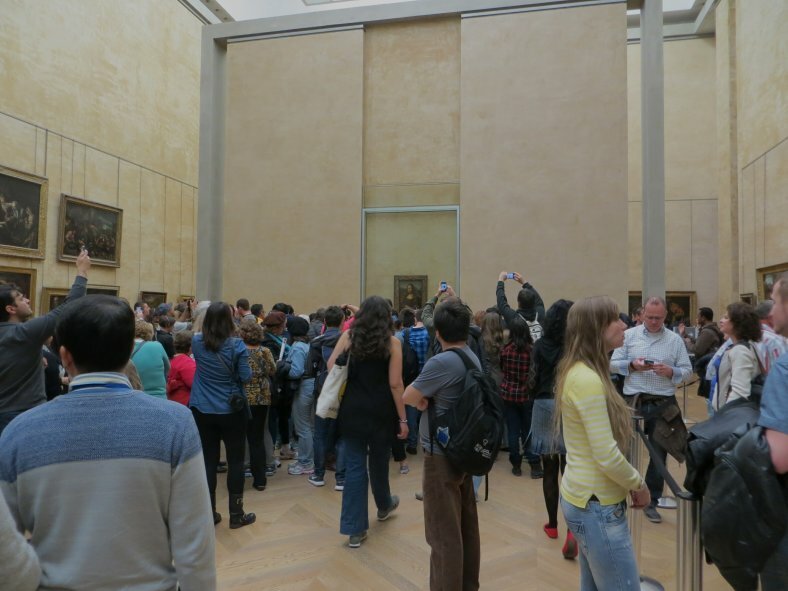 Of course the largest crowds were reserved for Leonardo da Vinci’s Mona Lisa. 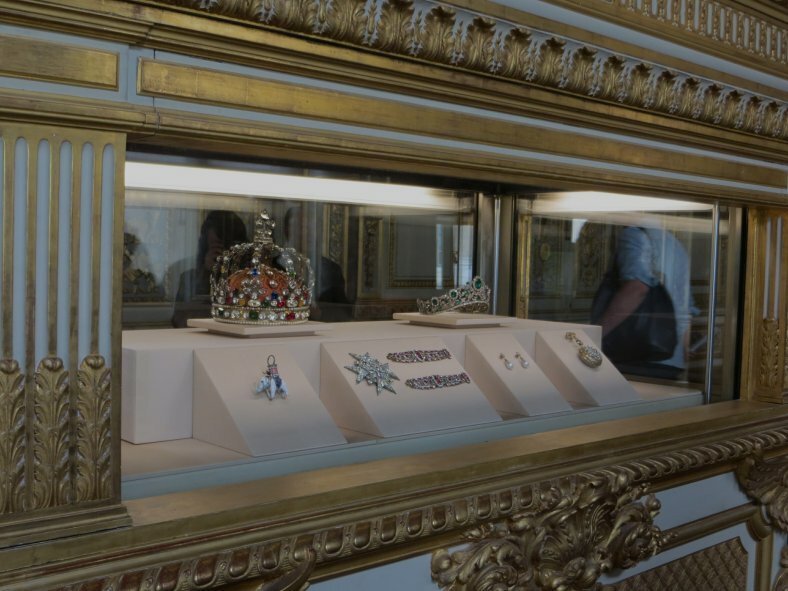 I could go on but I’ll stop with the French Crown Jewels. I mentioned that the Louvre is the world’s most visited and one of the largest museums. Aside from these two distinctions, it was also the first museum to do something else we take for granted today. Any idea of what that might be? And many others like Picasso, Cezanne, Degas, Van Gogh and Gauguin. 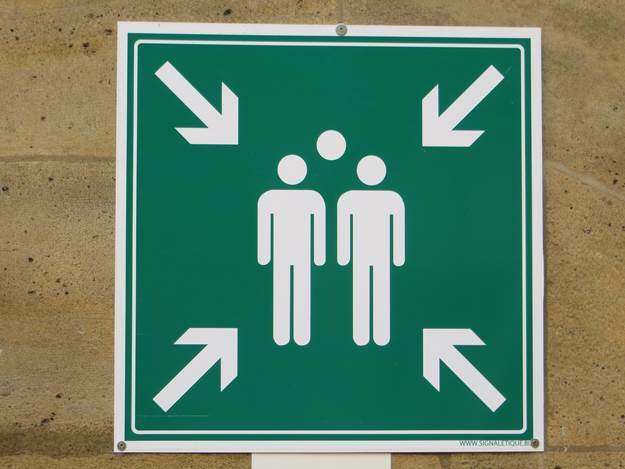 We had to do some investigation but this sign is indicating that this is the place where people should assemble in case of an emergency evacuation such as a fire. Office buildings, government centers, etc. have assigned assembly points. 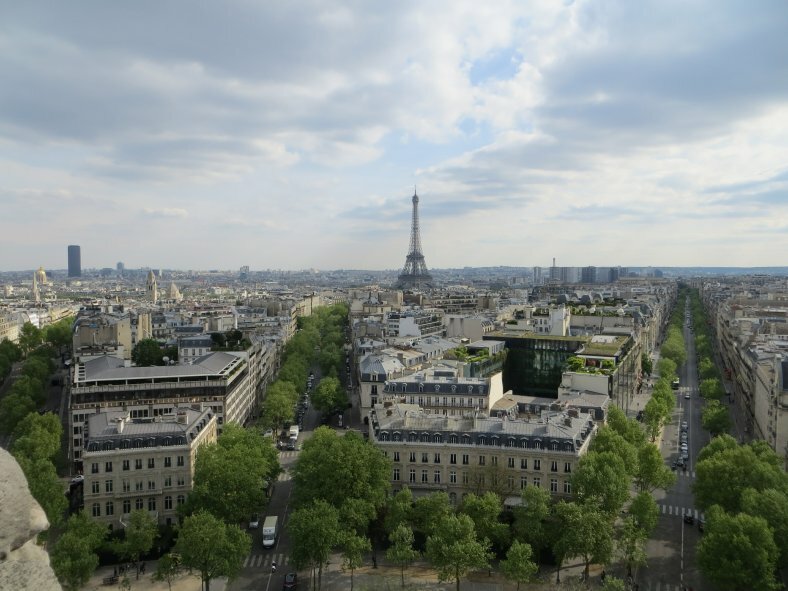 The nice weather returned this Monday in Paris. It was cool but mostly sunny which made our walk through the heart of Paris very pleasant. Our first stop today was at the Place de la Concorde, the largest public square in the French capital. What’s the connection between this square and where we were a couple of days ago, the Conciergerie? Tucked away in one corner of the square is the Orangerie museum. 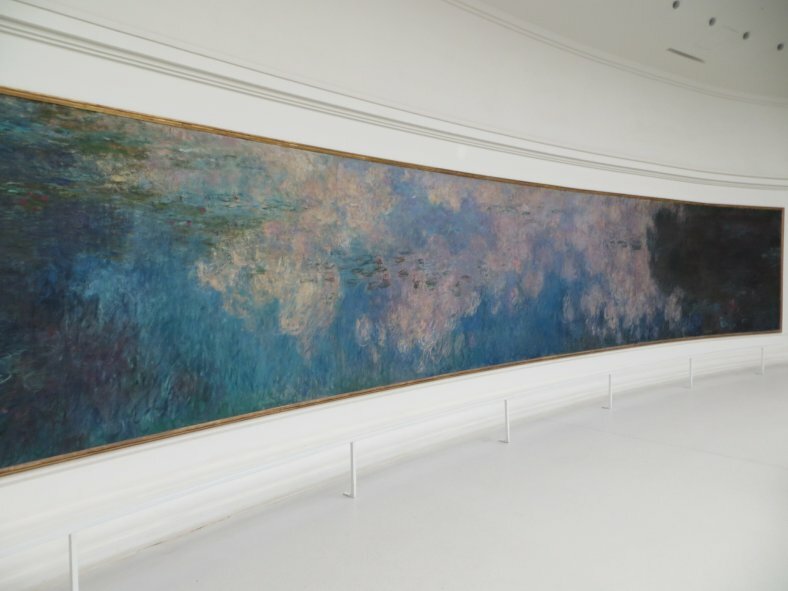 The main floor is nothing but Monet’s massive water lilies paintings which completely surround you in two different oval rooms. Kevin thought it was amazing while I found it a bit overwhelming. 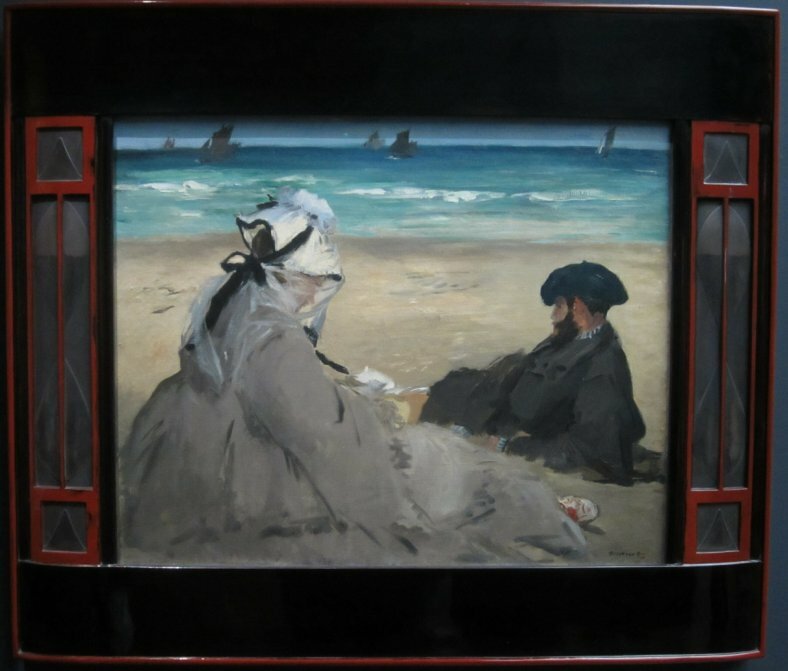 The lower floor has large collections of Picasso, Matisse, Renior, Cezanne and several other artists. 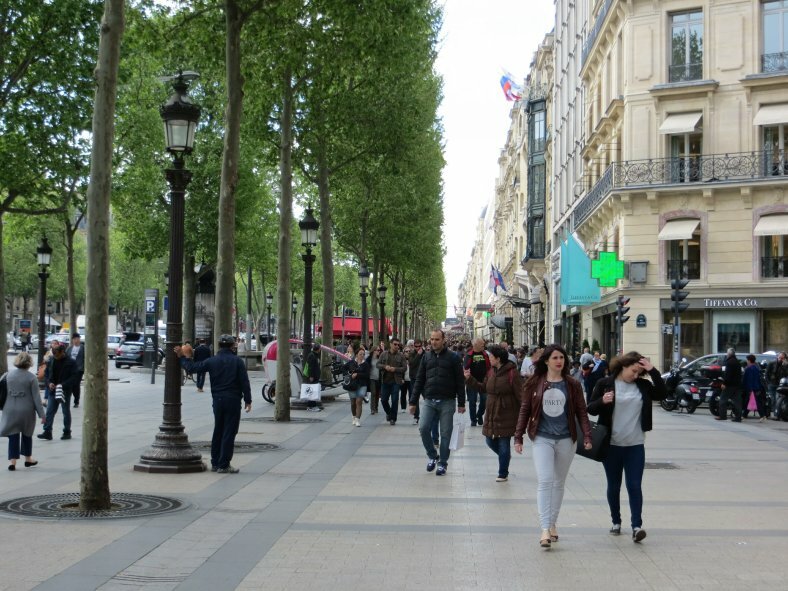 Next we began our stroll down the Champs-Élysées, some might say the NYC’s Fifth Avenue of Paris. 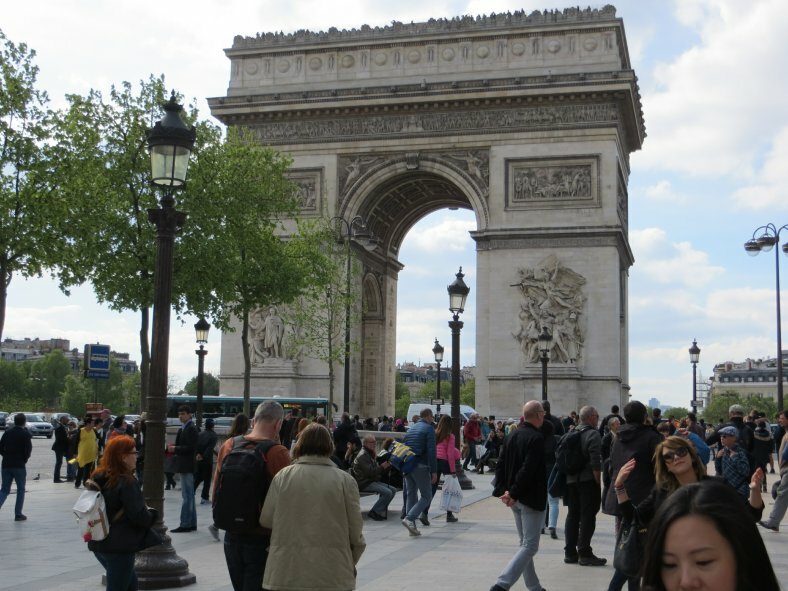 We stopped at a Paul’s Patisserie and bought some beignets so we’d have the strength to continue on to the Arc de Triumphe. 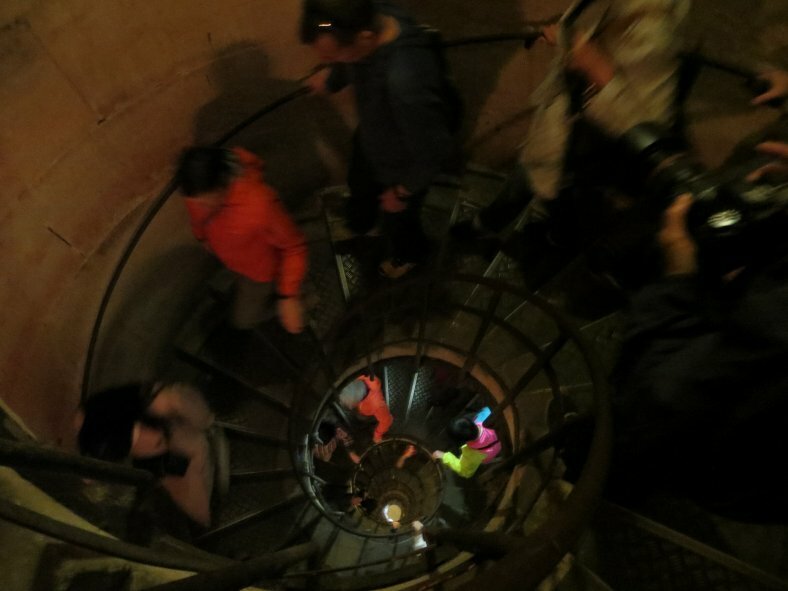 We were completely worn out after climbing the seemingly endless spiral steps up to the top. We stopped for supper at Flunch. Interesting place. First we chose and paid for our drinks and main dishes like at a cafeteria. Then we could add on all the vegetables like at an all-you-can-eat buffet. It was very good and extremely inexpensive. After dinner, we strolled through the narrow picturesque streets watching people and merchants. We couldn’t resist checking out the area KFC. We did get a correct reply to last night’s question about the Louvre. It was the first museum to be open to the general public. We’re wrapping up things here in Paris on this mostly sunny but cool Tuesday. 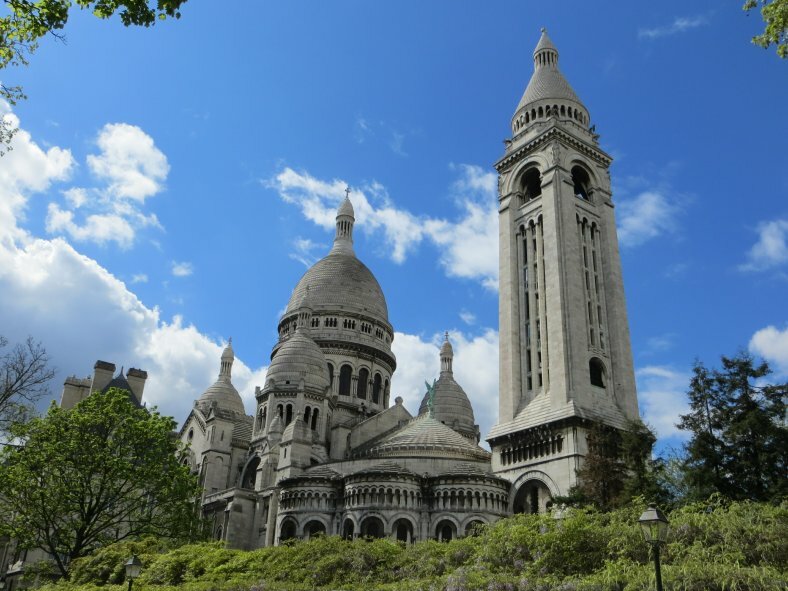 The first thing we did today was to take a most informative and fun “free” walking tour of the Montmartre area of Paris. 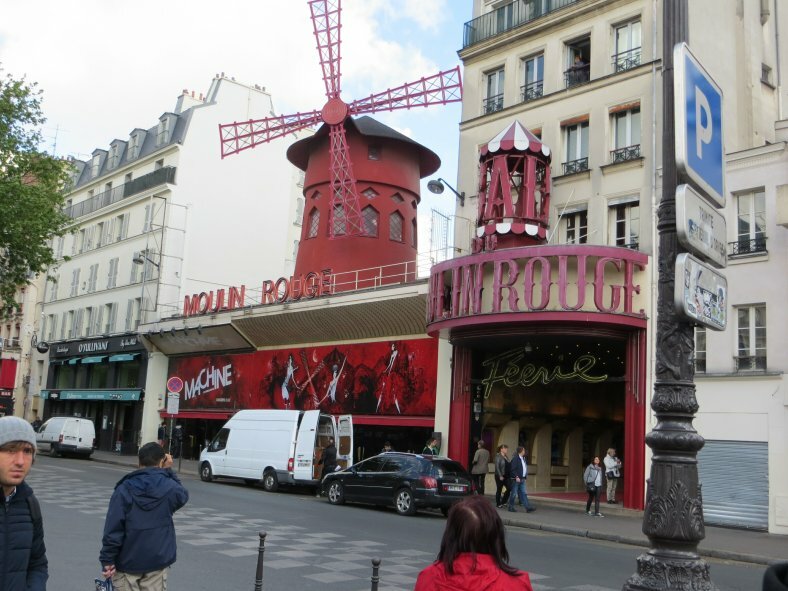 We started off at the famous Moulin Rouge nightclub. 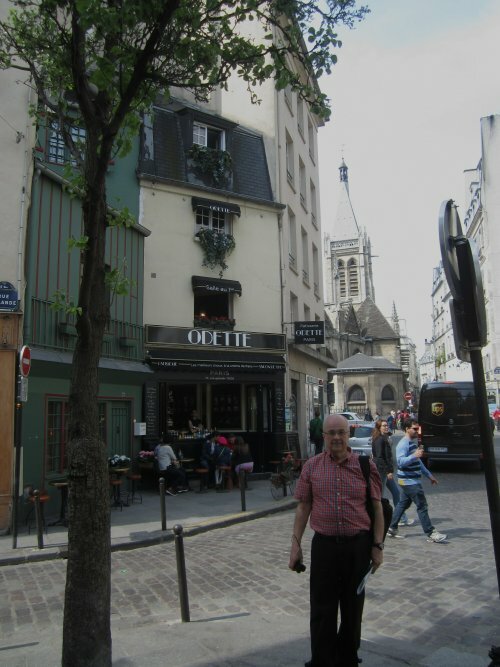 This is the area where the rich Parisians and the working class that lived in the then rural area of Montmartre came together to have a good time. From here we wound our way up narrow café-lined streets and wealthy neighborhoods until we came to this statue. St. Denis, the first Christian bishop of Paris seen here, was supposedly beheaded at what is now Notre Dame but was then a temple of Jupiter. 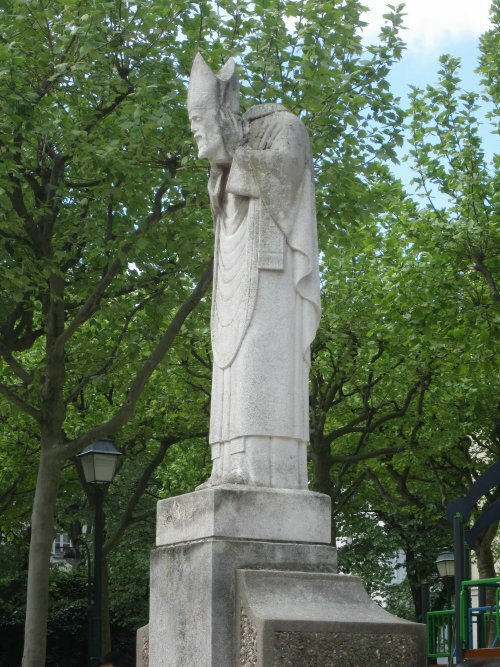 The story goes that he loved the Montmartre area so much that he gathered up his head and carried it to where this statue now stands. This was proof to the Paris residents of his holy status. Conversions soon followed. Our final stop on the tour was at the Sacré-Cœur Basilica. Unfortunately, no photos were allowed inside but it’s impressive enough from the outside. 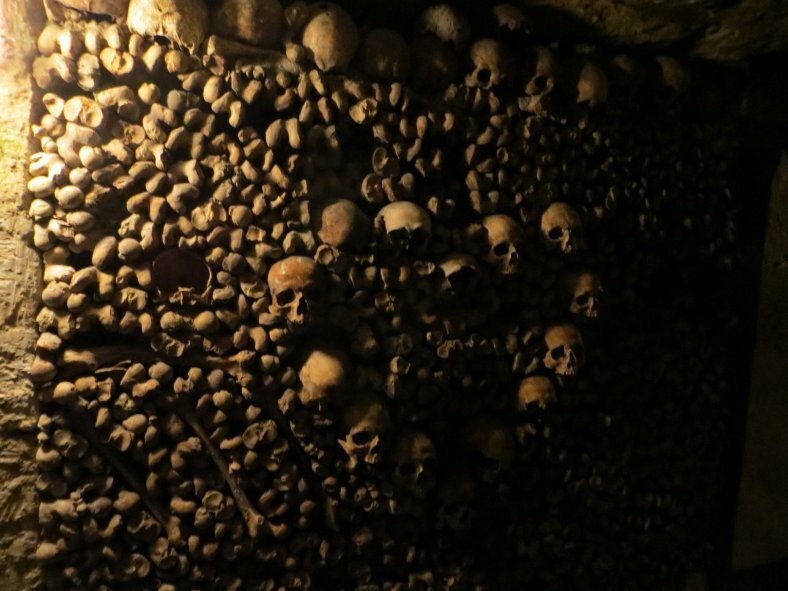 Our final stop today was at the Catacombes de Paris. I can’t begin to describe how unsettling this place is. 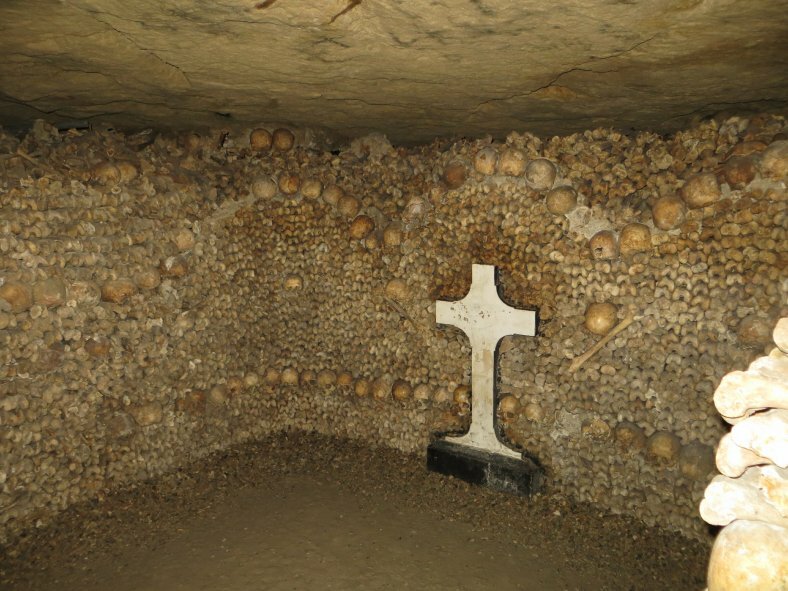 The history and rationale behind removing bodies from cemeteries and piling up the bones here is more than I want to get into, but here’s a sample of what we saw. And, yes, you were right on yesterday’s question. 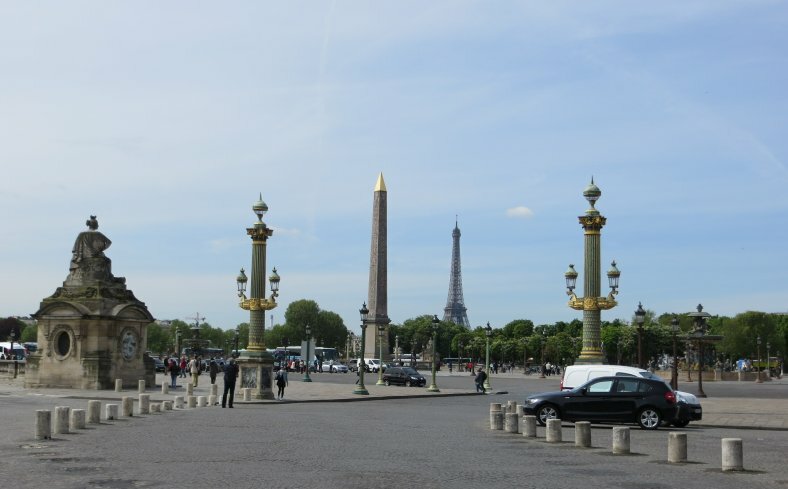 During the French Revolution, many were taken from the Conciergerie to the Place de la Concorde to face the guillotine. We’ll write you tomorrow from Amsterdam. The video below is 111 minutes long of Dan & Kevin's six days in Paris. We had to say farewell to Paris today. 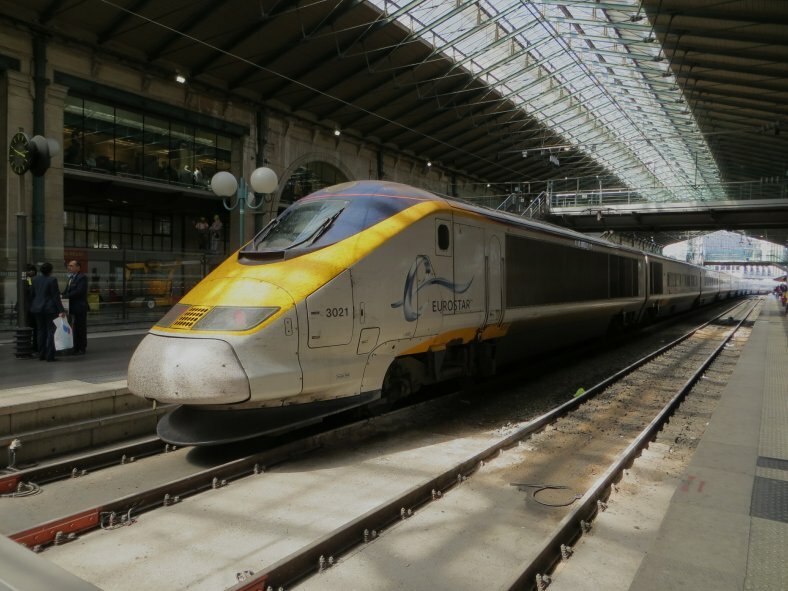 The Thalys train left Gare de Nord at 12:19pm for a 3½ hour smooth fast train journey, passing through Brussels, Antwerp, and Rotterdam. we boarded the metro for the Holiday Inn Express Arena Towers. 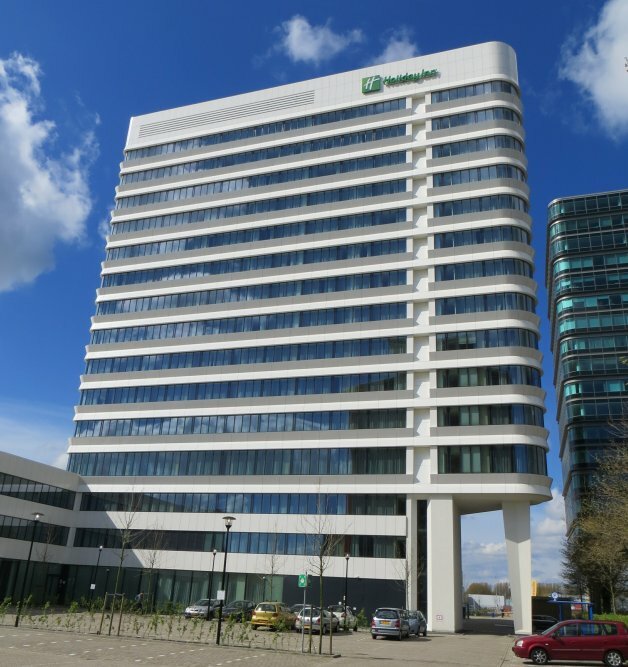 It’s a very modern hotel near the soccer stadium. We only stopped long enough to drop off the luggage before heading back into the center of Amsterdam. I can’t wait to explore the city further. 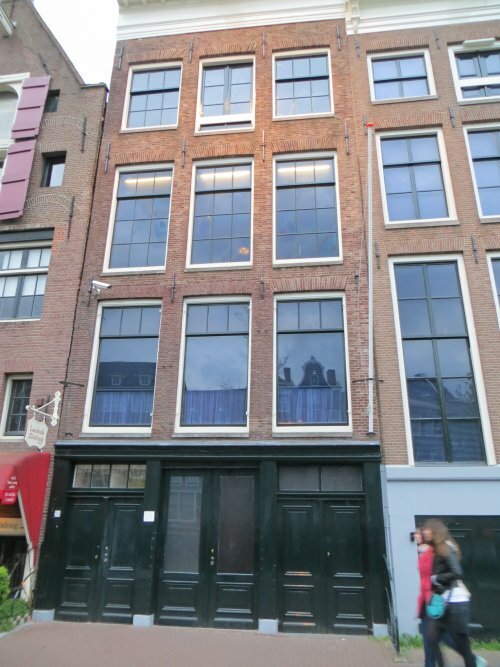 Today, our only stop was to the Anne Frank House. Though I cannot tell you anything you probably don’t already know, I can say it was quite moving to actually go through the house and listen to her father’s words. What actress won an Academy Award for her role as one of those hiding in this house? 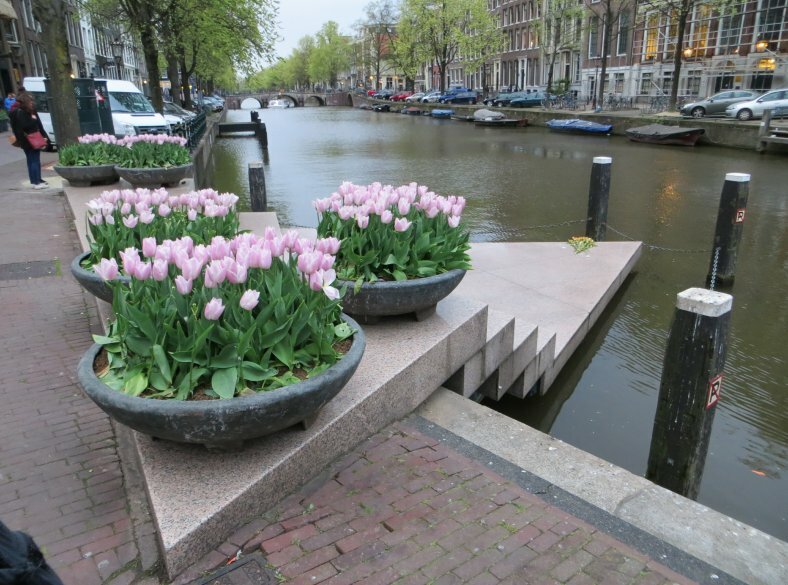 Right around the corner from the Anne Frank House is the Homomonument. Opened on September 5, 1987, it commemorates all gay men and lesbians who have been subjected to persecution because of their homosexuality, a key reality that is often overlooked in relation to the holocaust. We’ll explore more of Amsterdam during the next three days. It was a partly cloudy but mostly sunny and cool Thursday in Amsterdam. 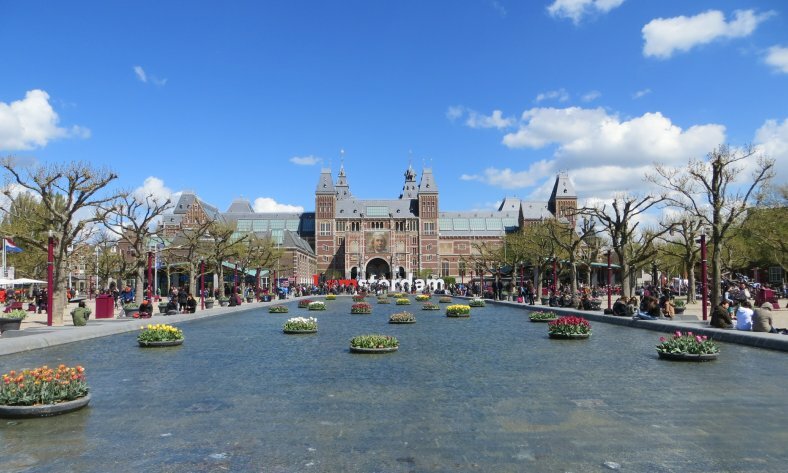 Today was dedicated almost entirely to the Museumplein where most of Amsterdam’s “best” museums are located. 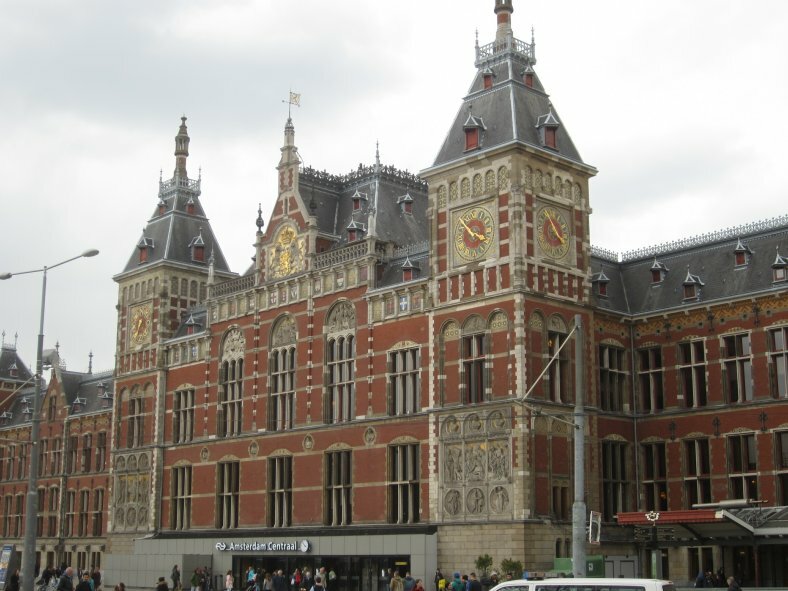 The first of the three we visited today is the most visited in the Netherlands, the Rijksmuseum. While the collection holds over a million objects from the years 1200-2000, the main focus is on Dutch artists. 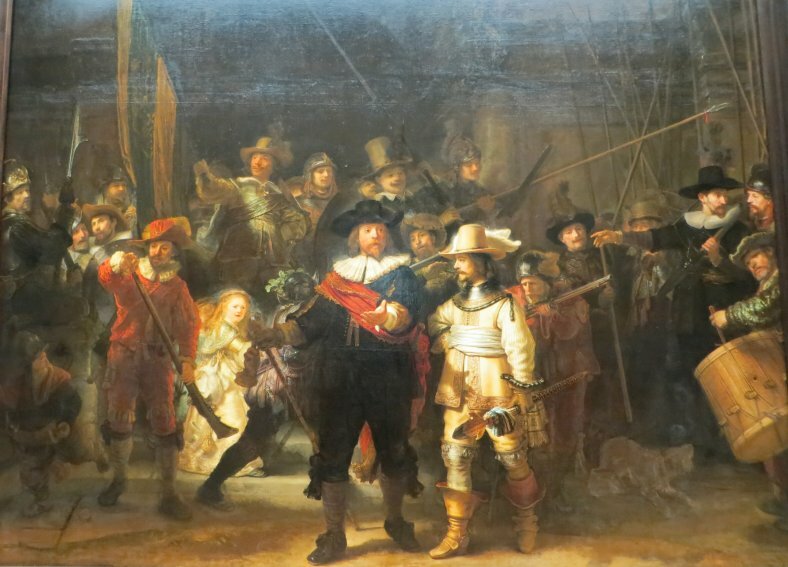 The Gallery of Honour’s place of honor is held by Rembrandt’s masterpiece The Night Watch. 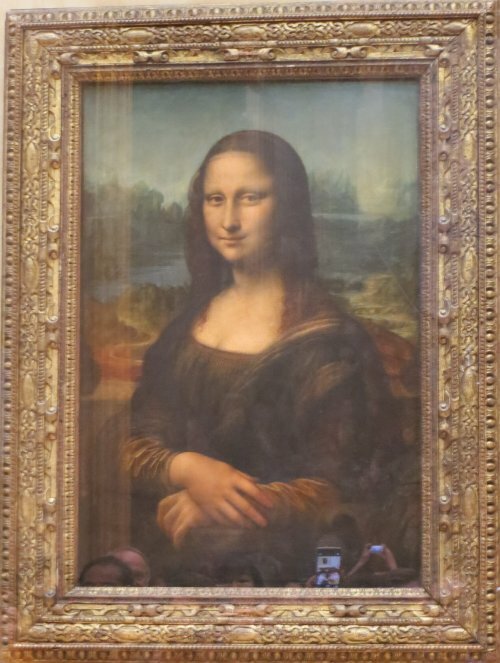 There were almost as many people clamoring to get a close view of this as there were around the Mona Lisa. Our next stop was the Van Gogh Museum next door. The lines to get inside, with or without tickets, were very long. We waited at least an hour and had to rush through as closing time was approaching. Photos were not permitted, and in fact the museum was a bit of a disappointment, so I’ll just move on. Finally, we spent our next two plus hours in the Stedelijk Museum of modern art. 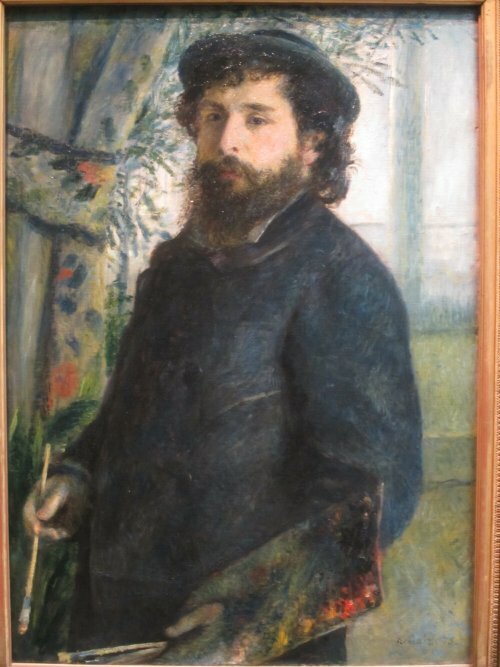 While there were works by Picasso, Van Gogh, Warhol, Kandinsky and others of note, there was also an incredible amount of “art” a three year old could have done. Kevin disagrees with me. We were also treated to three “artists” moving around us and singing, “this is contemporary” over and over and blocking our attempted escape from this nonsense. 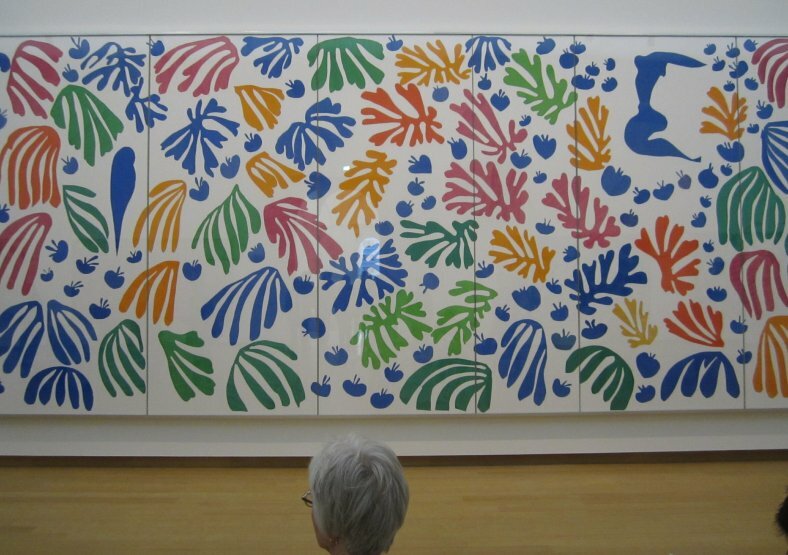 But the main focus of the museum was on Henri Matisse. But I’m going to turn to a Hoosier artist for today’s question. It’s a two-parter. 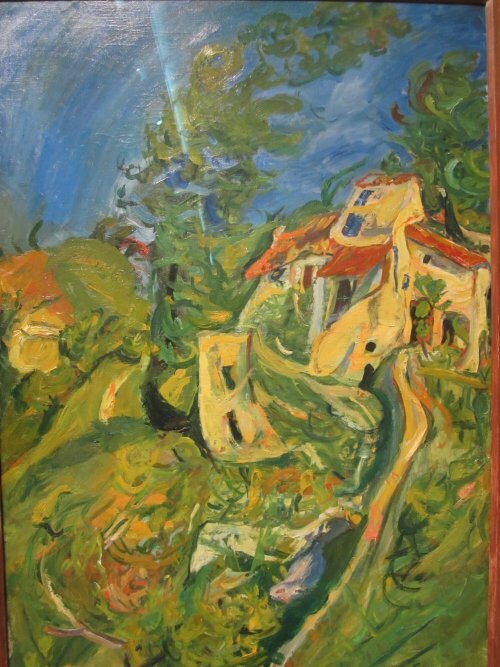 What artist created the below and what are they titled? 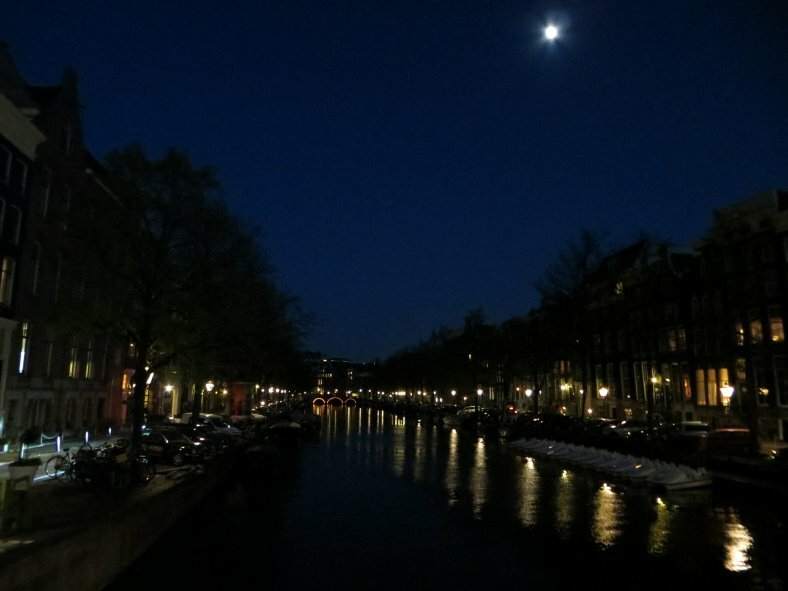 After having a wonderful spaghetti carbonara dinner, we wandered through the narrow streets and over several canals. We had but one correct answer of Shelley Winters winning best supporting actress for 1959’s The Diary of Ann Frank. Well, I know you’ve been waiting for the mystery to be solved as to what are the titles of these two works from yesterdays’ journal. 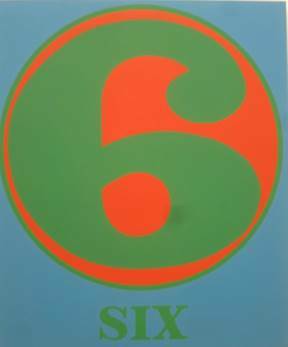 They are in fact titled Six (left) and Eight (right). 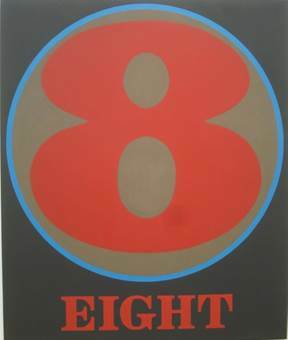 And, as several of you knew, they were painted by our own fellow Hoosier, Robert Indiana. Anyway, it was once again another partly cloudy and cool day in the 50s here in Amsterdam, an area home to around two million people. Rick Steves via podcast and pocket guide guided us around the city center today. 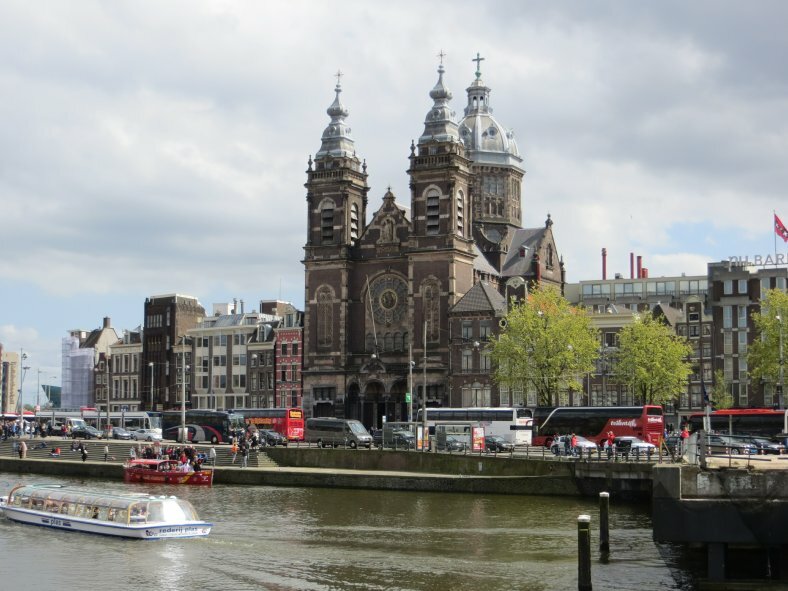 But before we started our walk, we took a cruise of the canals of Amsterdam. Sometimes known as the “Venice of the North,” Amsterdam is encircled by a series of canals that ring the city center. Several companies offer sightseeing cruises along the canals. After the hour long cruise, we began the walk starting at Central Station proceeding south down Damrak which was once a riverbed. We stopped at a couple shops buying cheese and the local obsession, French fries (locals dip them in mayonnaise). 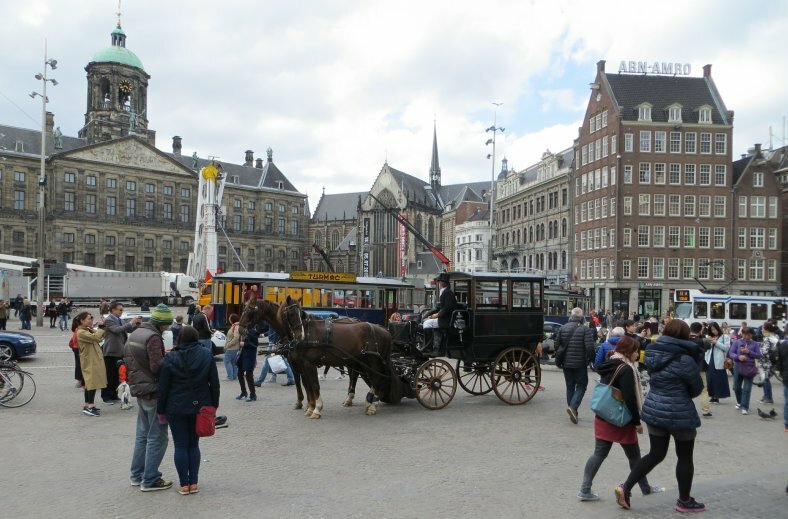 Dam Square is the heart of the city. Unfortunately, they were tearing down some amusement park rides so the area was a bit cluttered. Despite its name, Royal Palace (left) is really the former City Hall. In medieval times this is where the city council and mayor met. It became known as “royal palace” when Napoleon invaded and installed his brother Louis as king. It is one of the four official residences today of King Willem-Alexander. New Church (center) is actually 600 years old. 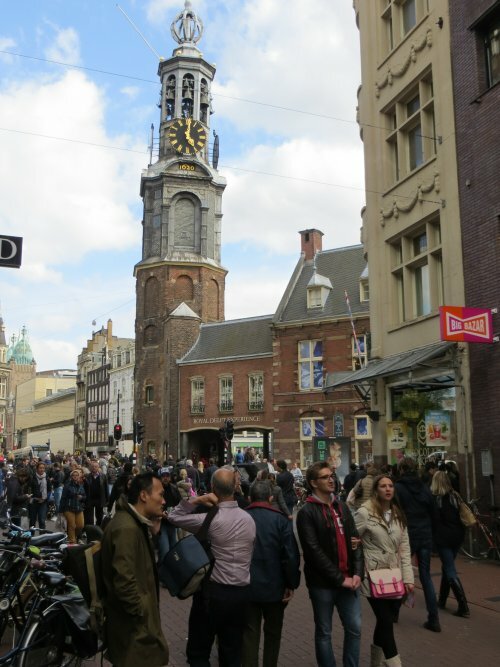 We headed off from Dam Square down the pedestrian-only Kalverstraat which ends at the Mint Tower. 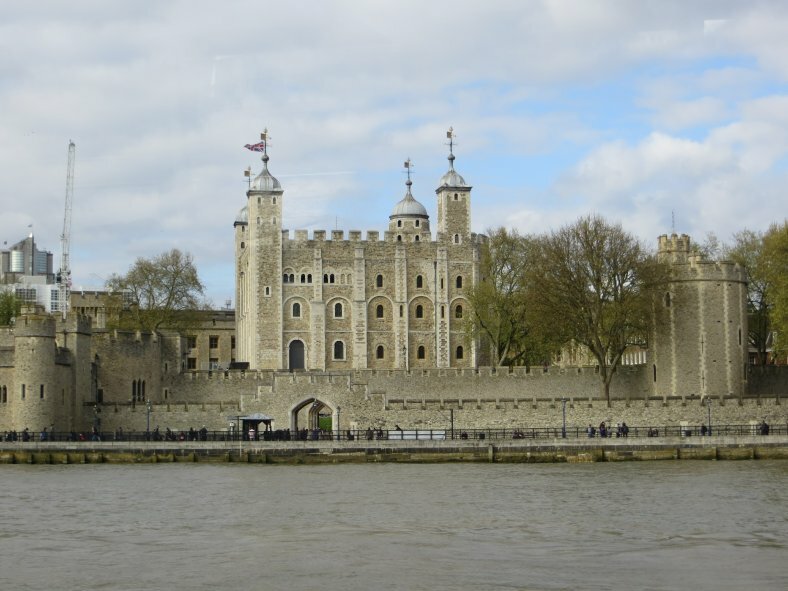 The 1620 date on the tower makes this area very popular with stoners. Unfortunately not far from here we passed someone who had just been run over by a bicycle lying on the ground, surrounded by policemen. The ambulance was on the way. 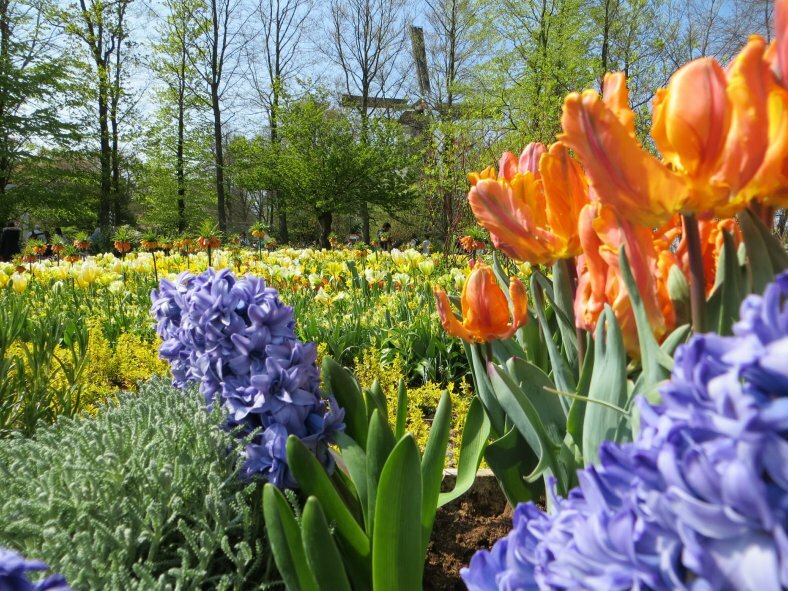 Tomorrow we’re taking a short road trip to the Keukenhof Gardens. We’ll leave 'til then you with this picture. Any idea what it is? 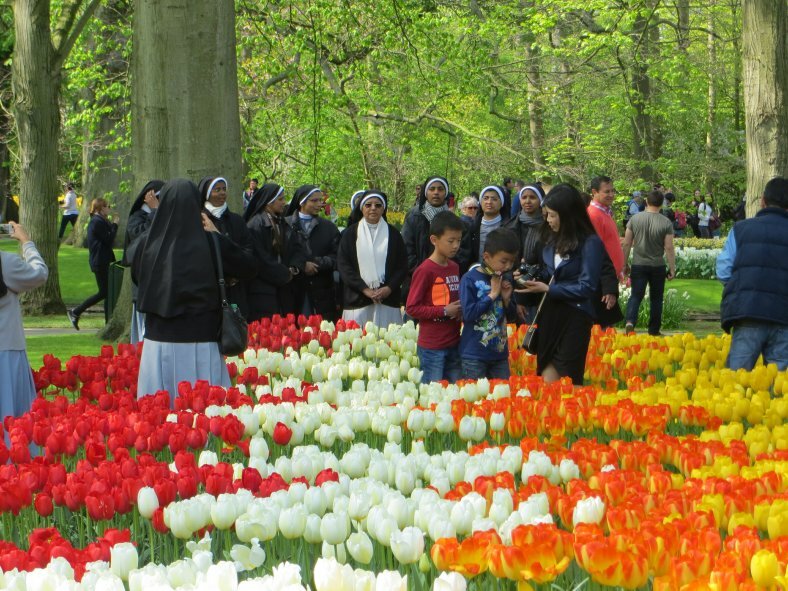 When we got to Amsterdam we checked the weather forecast and slightly altered my carefully arranged itinerary so that this would be the day we went to Keukenhof Gardens. It was a gorgeous bright and sunny Saturday in the low 60s. Going today was not a unique idea on my part. 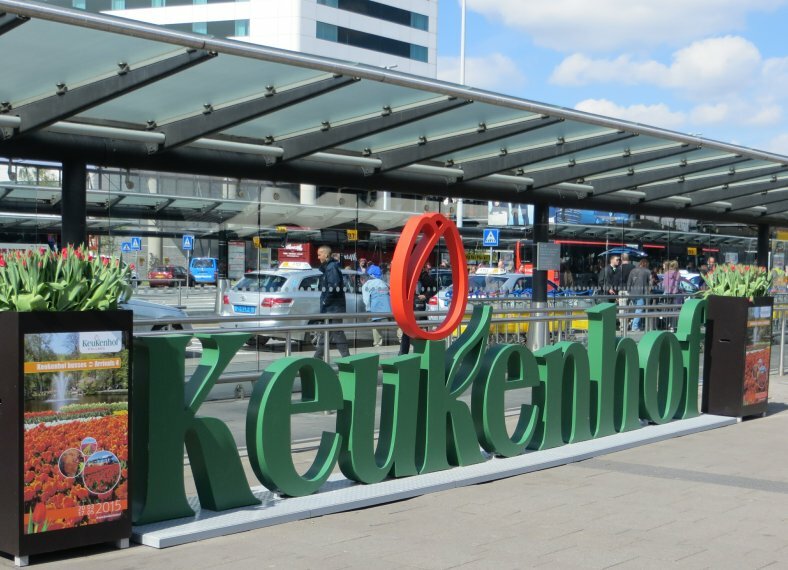 When we arrived at the airport/train station where we were to catch our “express” bus to Keukenhof, the line stretched completely around station exterior. We waited an hour and 45 minutes to board the bus. The whole journey took a little over three hours total. BUT it was worth it. 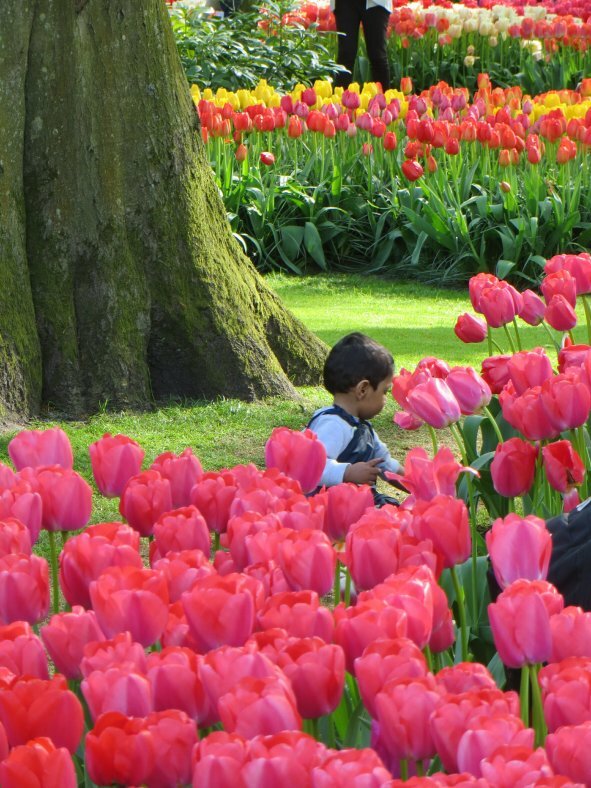 Also known as the Garden of Europe, Keukenhof is the world’s second largest garden following the Dubai Miracle Garden. 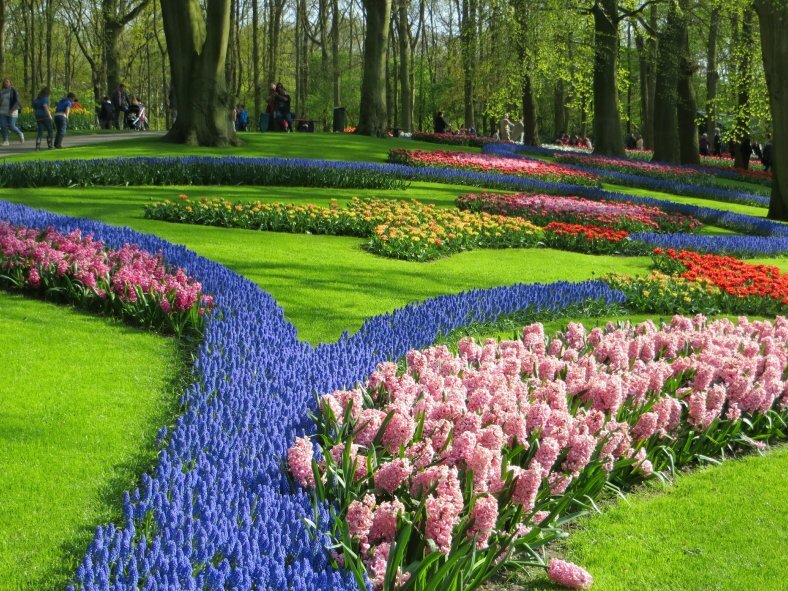 They claim to plant approximately 7 million flower bulbs annually in the park of 79 acres. Here is but a small sample of this spectacular garden. We had a lot of correct answers to yesterday’s question. The picture was of a three-story bicycle-only parking garage. 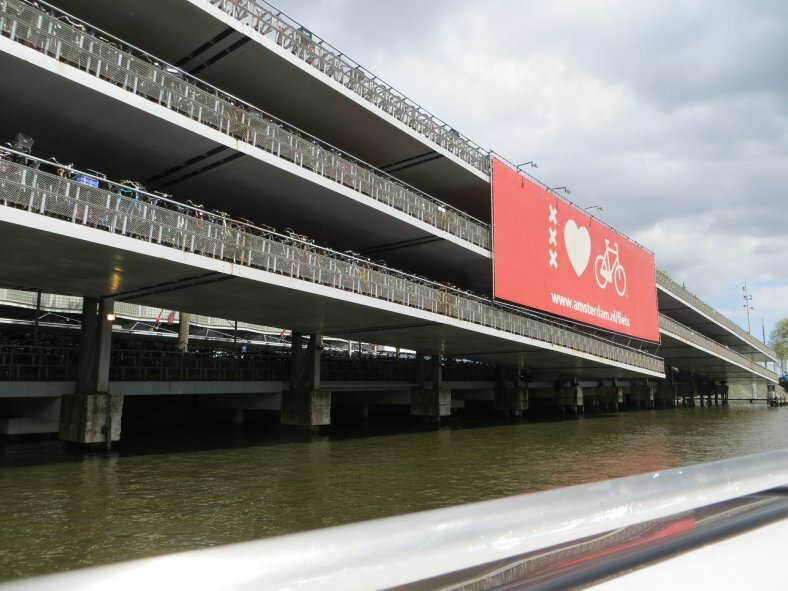 It holds over a thousand bikes (at no charge). 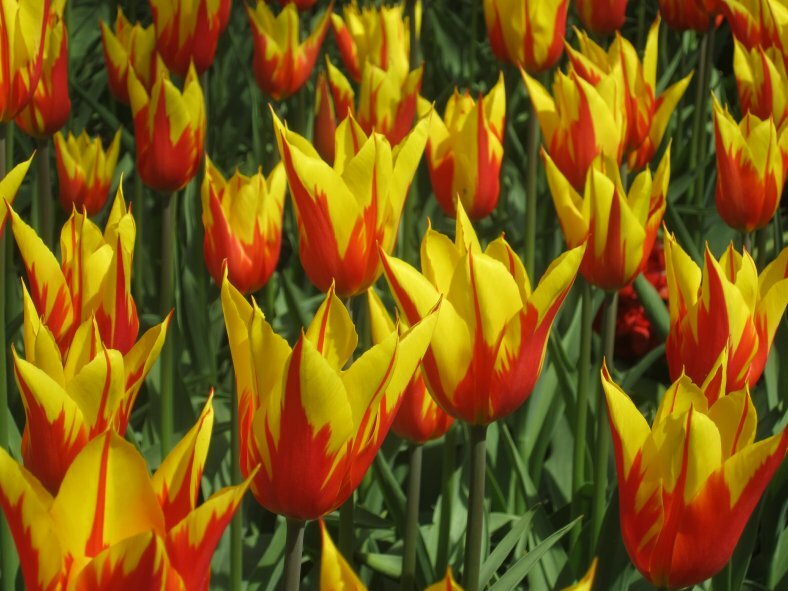 Today’s question, what else did the Dutch do with tulip bulbs besides plant them? Hint, it took place between 1944-1945. We’ll write you tomorrow from Germany. The video below is 38 minutes long of Dan & Kevin's four days in Amsterdam. We are in Berlin. Sunday was just a 6½ hour train trip from Amsterdam to Berlin. There were no pictures of much interest to share. 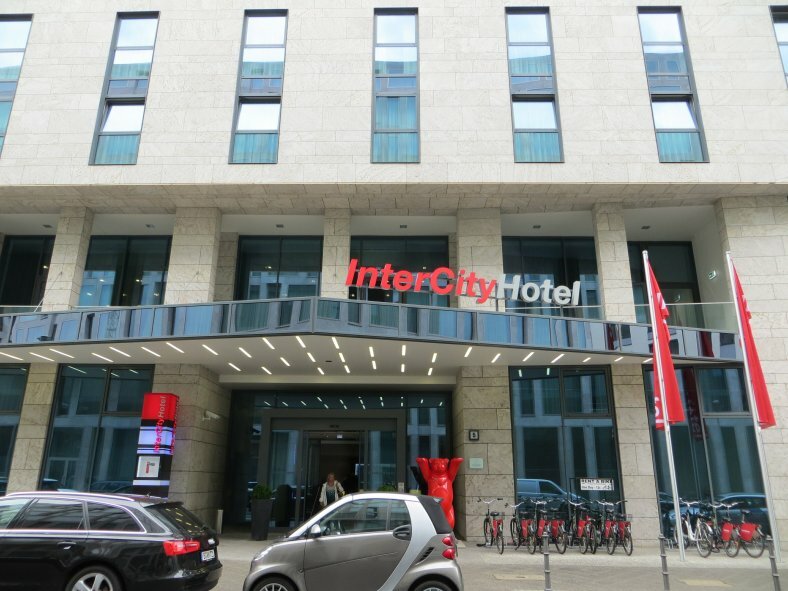 We are staying at the InterCity Hotel Berlin. 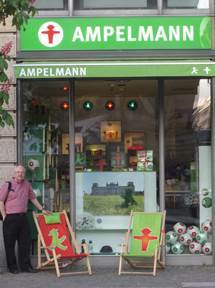 We began exploring the German capital with a population of about 3 million people early Monday afternoon. 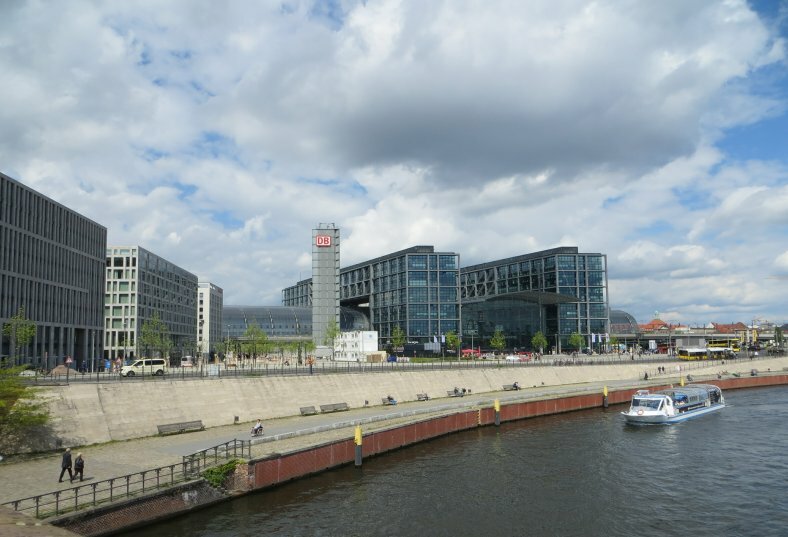 We walked from the InterCity Hotel Berlin Hauptbahnhof Station across the Spree River. 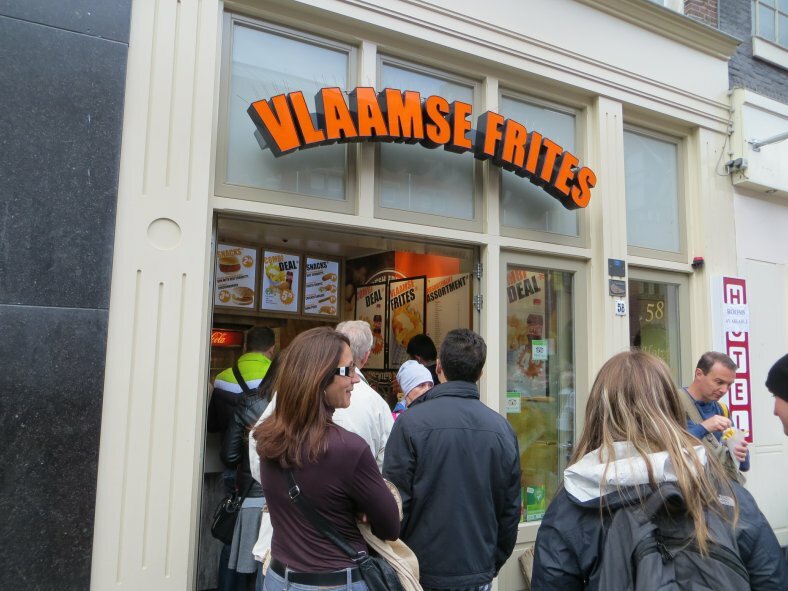 We again used a Rick Steves’ podcast to guide us through the city. 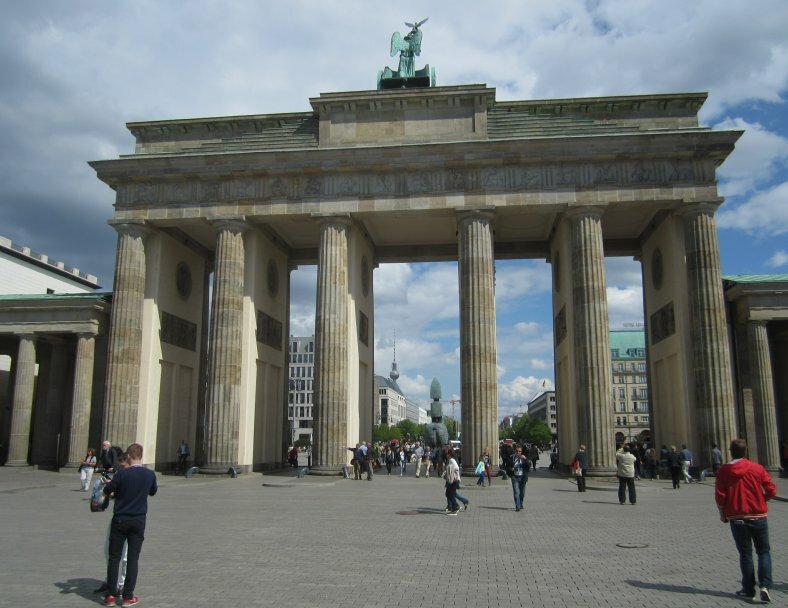 One of our first highlights was the Brandenburg Tor. Today we easily walked right through this gate, from west to east without any checkpoints, barbed wire or walls to stop us. 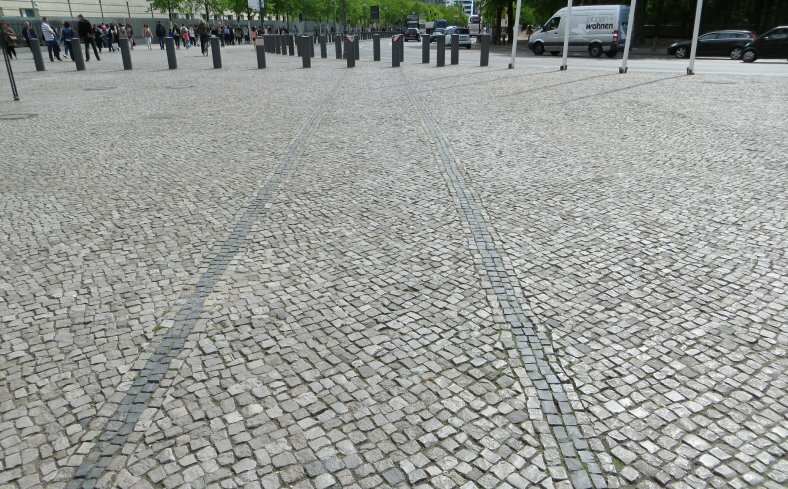 Stones along the ground mark where the Berlin Wall used to separate East and West Berlin. The wall came down just 26 years ago in 1989. All around are signs of a city just starting to make reunification a reality. 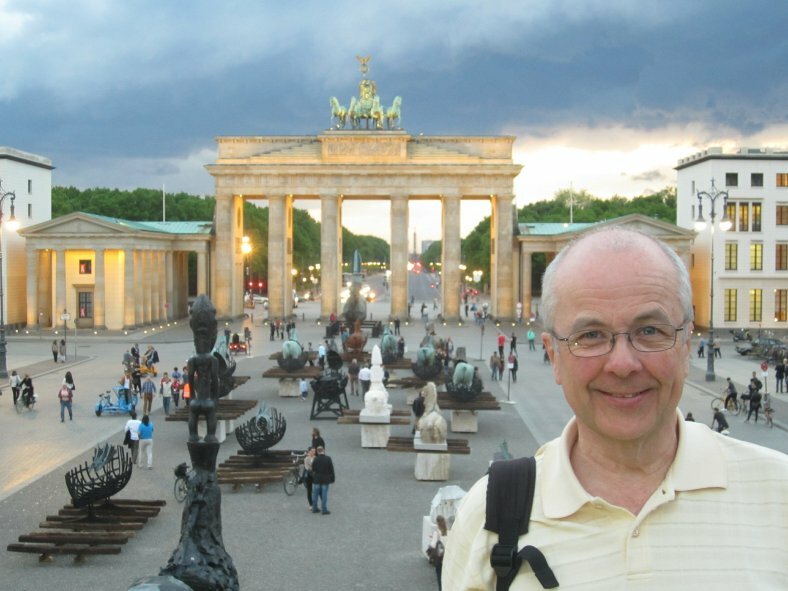 Once through the Brandenburg Gate we proceeded for most of the day in the former East Berlin along Unter den Linden. Literally the street name translates to “Under the Linden” trees which line this major road. 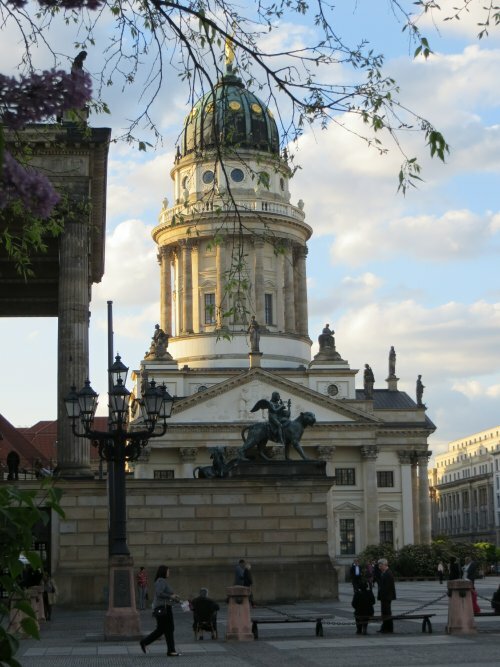 Two of the many sites were the Berliner Dom and the tallest structure in Europe, the TV Tower. 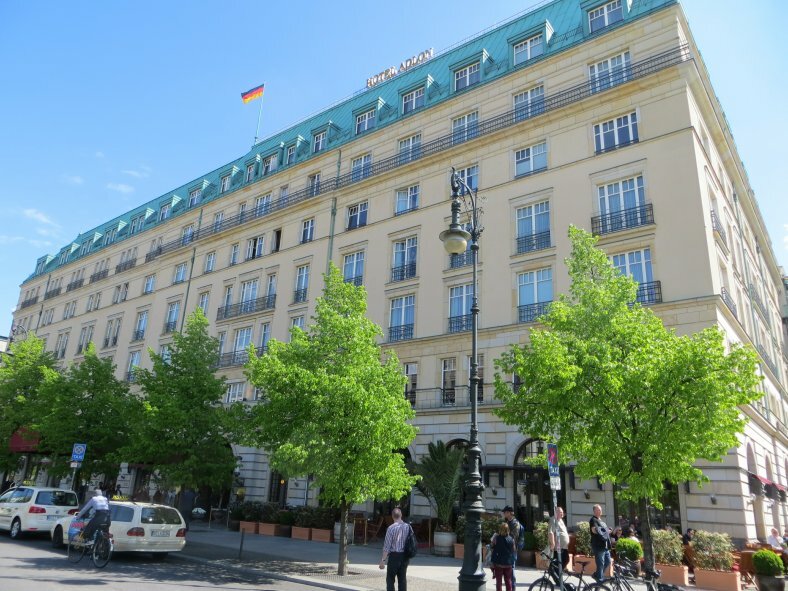 One other sight along the way was the famous Hotel Adlon used as the Grand Hotel in which Greta Garbo said “I want to be alone.” Another pop icon made the headlines in 2002 from this hotel. Any idea what I’m talking about? 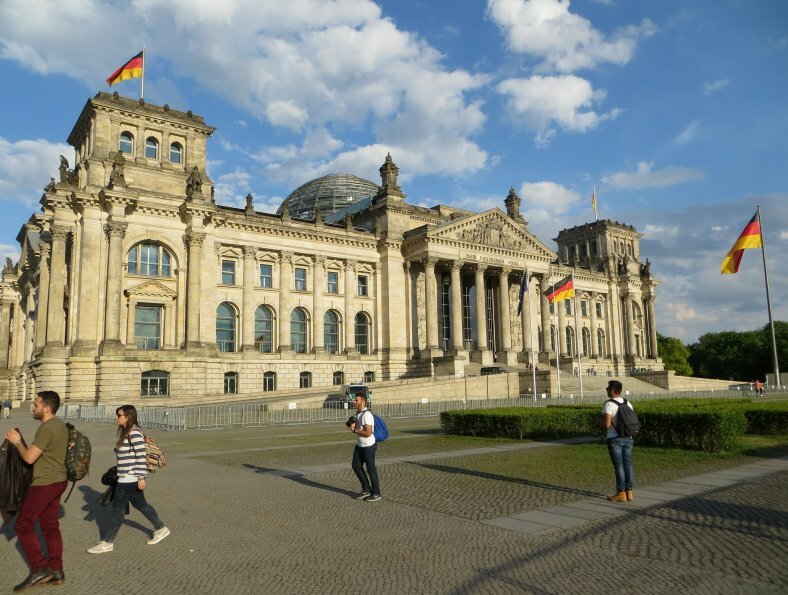 We returned to where we began our walk at the German parliament equivalent, the Reichstag. This building, like so much of Berlin was largely destroyed during the bombing of World War II. The exterior has been restored to pre-WWII status, while the interior is new construction. That includes the new dome on the top of the building. 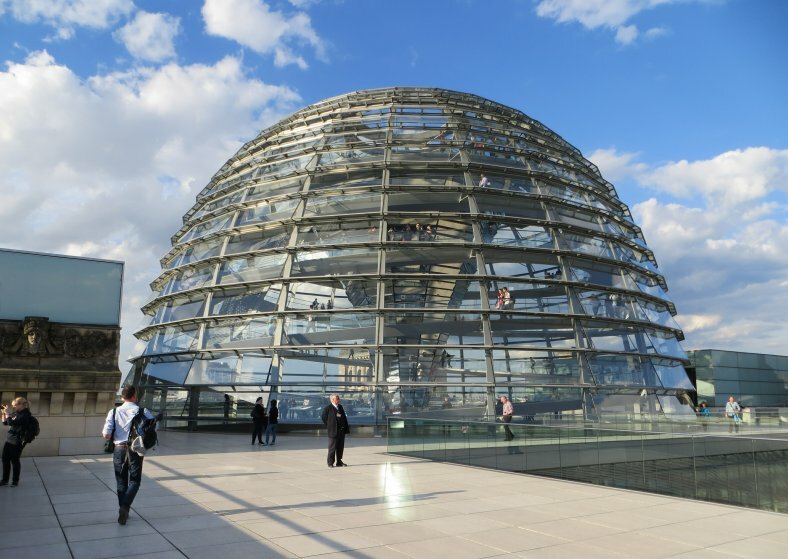 While walking a spiral ramp to the top of the dome, an audio commentary on Berlin explains what you are seeing outside. Now to wrap up unfinished business. 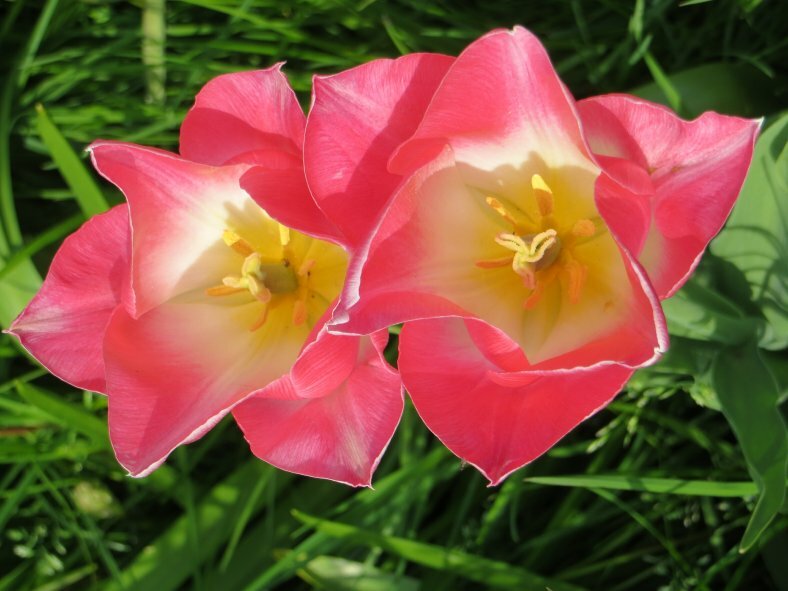 While it is true, as many of you reported, that the Dutch historically used tulip bulbs as speculative investments back in the 1600’s--during the famine of 1944-45 they were forced to eat them. Thanks for all the many replies to this question. I love the input! We did a little more exploring of Berlin today. Above ground trains were not running because of a strike which will continue until the end of the week. That made us use buses a bit more than we planned, but we got around just fine. We only had to walk a couple blocks to get to the Spree River for a boat cruise of the center city (and we had a coupon!). 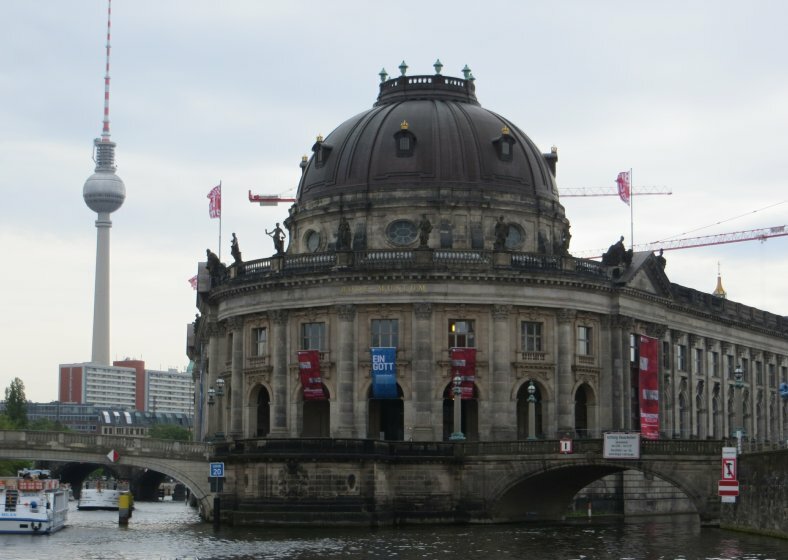 Though we didn't visit this museum, this is one of the five museums on Museum Island. This island in the middle of the Spree is where Berlin was born. After the cruise, we spent the rest of the afternoon at the German History Museum. Kevin learned some interesting family history via some of the exhibits here. But this painting made me smile. 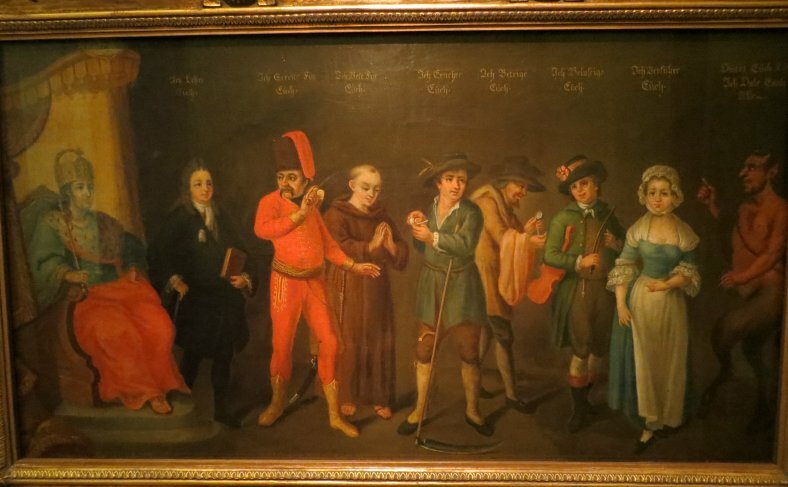 It shows a member of royalty on the left and the Devil on the right with various professions in between. Those closest to the Devil are a servant girl, a performer, a street hawker and a peasant. A monk, a soldier and a scholar are nearest royalty/God. The museum was closing and we were hungry so we went in search of a restaurant that served German food. 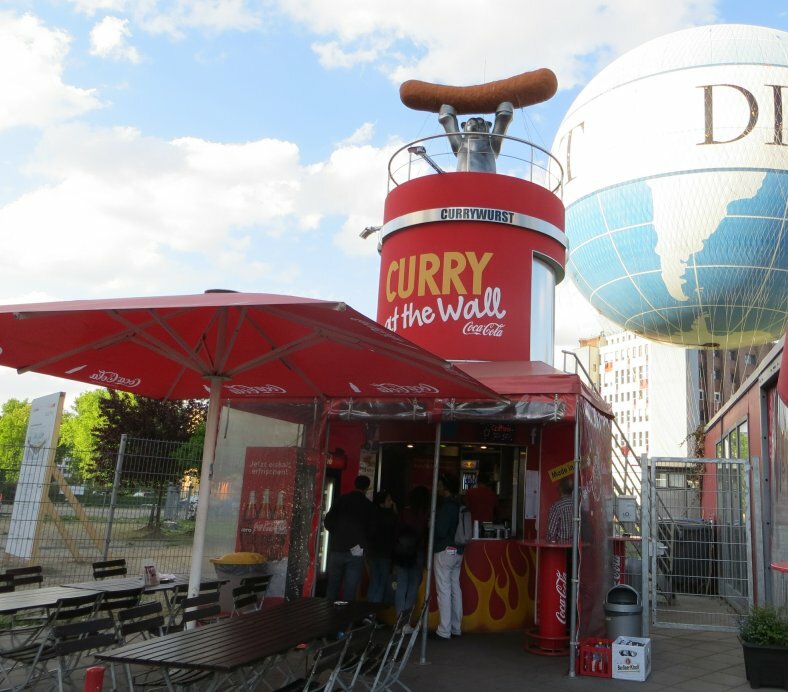 When we found one, we both ordered and enjoyed a different sausage and potatoes meal, mine the local obsession currywurst. 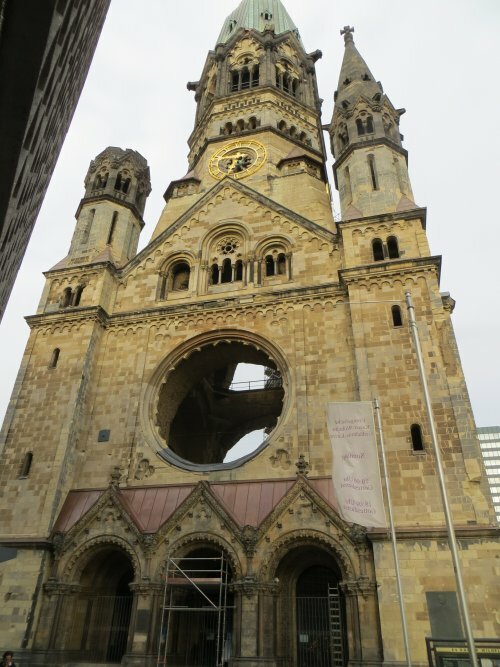 Near the restaurant is the Kaiser Wilhelm Memorial Church, both the war-damaged one being restored and the new one next door. 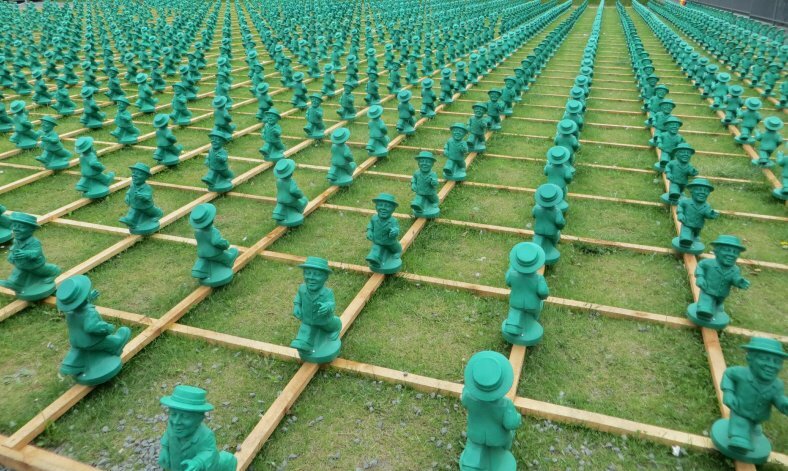 What’s with the green walking man and bears everywhere? 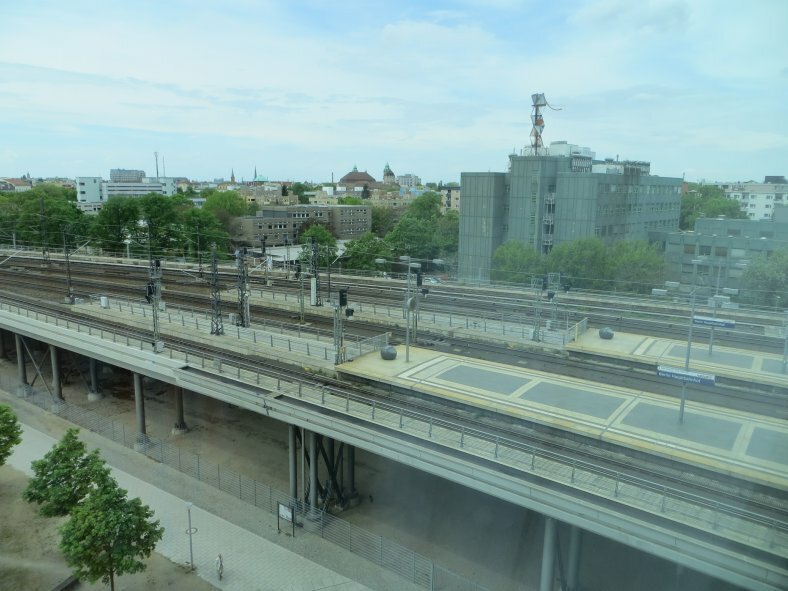 As you can see from the picture below of Europe’s largest train station, not many trains were moving today due to the week long strike. 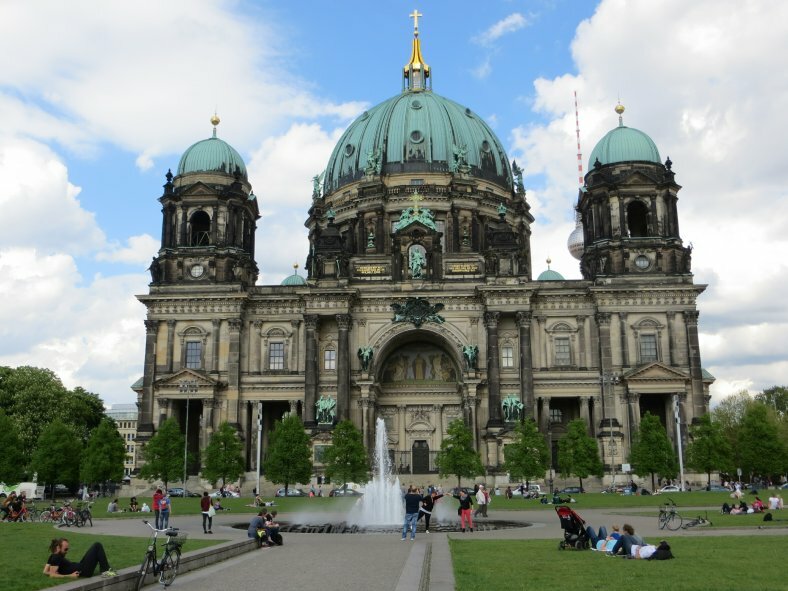 We had planned to take a day trip to Potsdam to see Prussian King Frederick the Great’s palaces, but since the trains weren’t moving, we remained in Berlin. 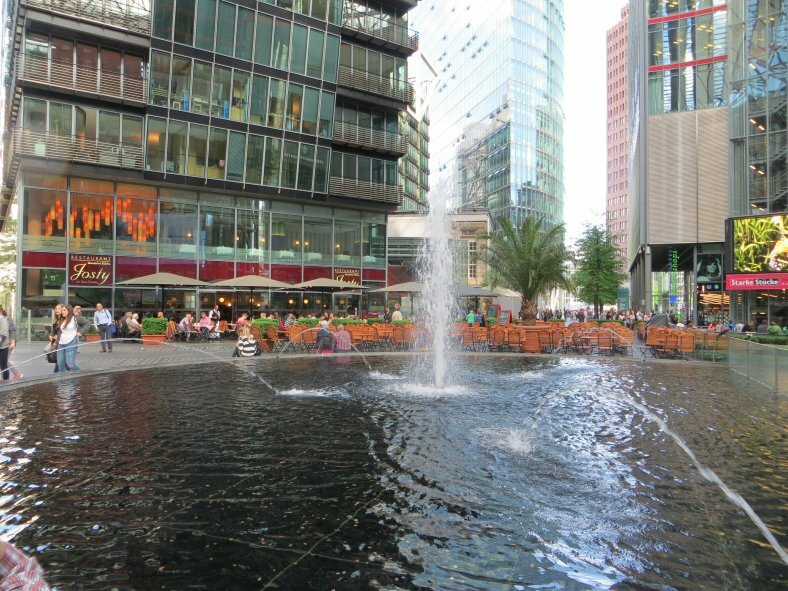 Since we had more time in the city than we planned, we took a bit of a break from sightseeing to see an English language showing of The Second Best Exotic Marigold Hotel at the fabulous Sony Center in Potsdamer Platz. 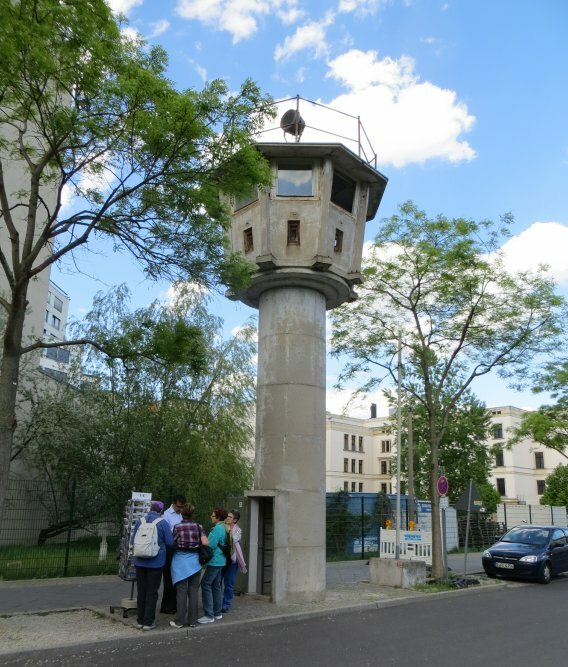 A brief walk from Potsdamer Platz brought us to one of the few remaining old Berlin wall watchtowers. 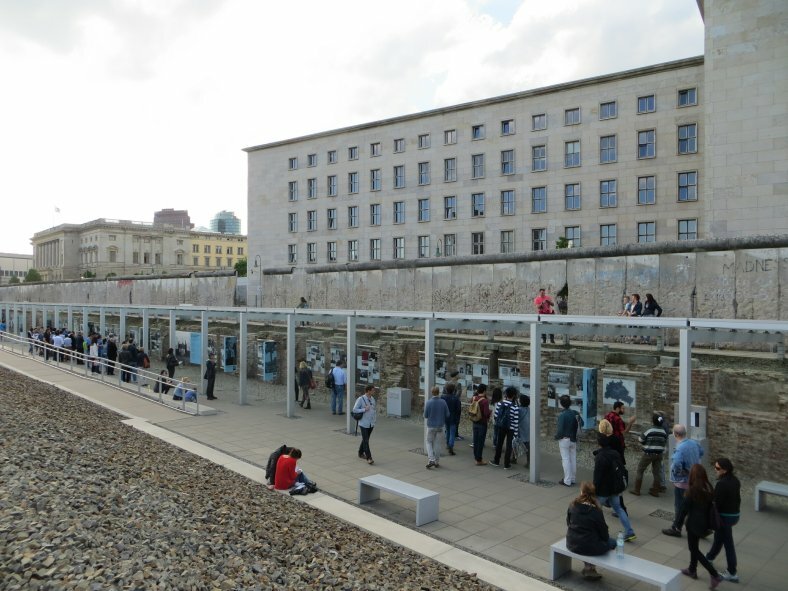 One of the few places where the old wall remains is the called the Topography of Terror. 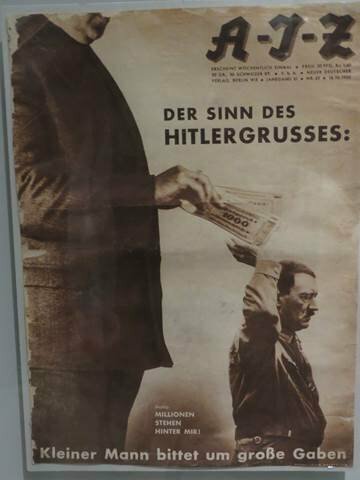 Below the wall, pictures and old newspaper articles are displayed of the Hitler era. 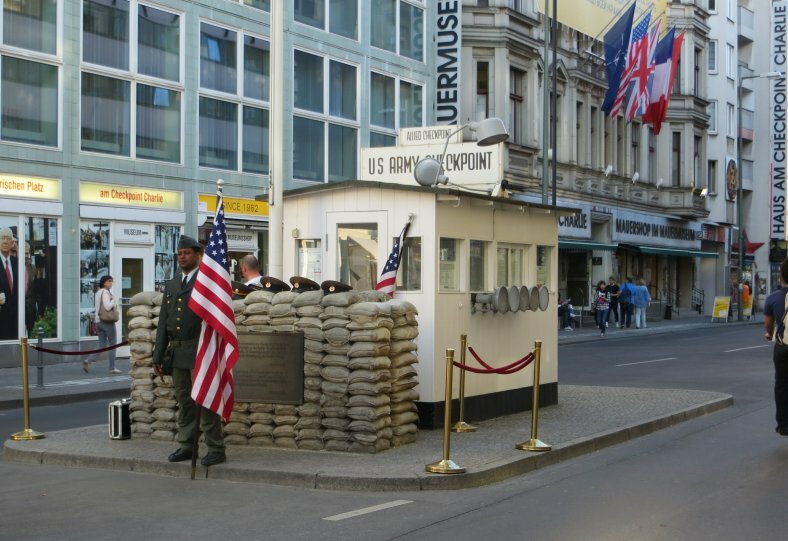 About two blocks away is where most foreigners crossed the walled border, Checkpoint Charlie. It’s largely a tourist trap today. Why was it named Charlie? 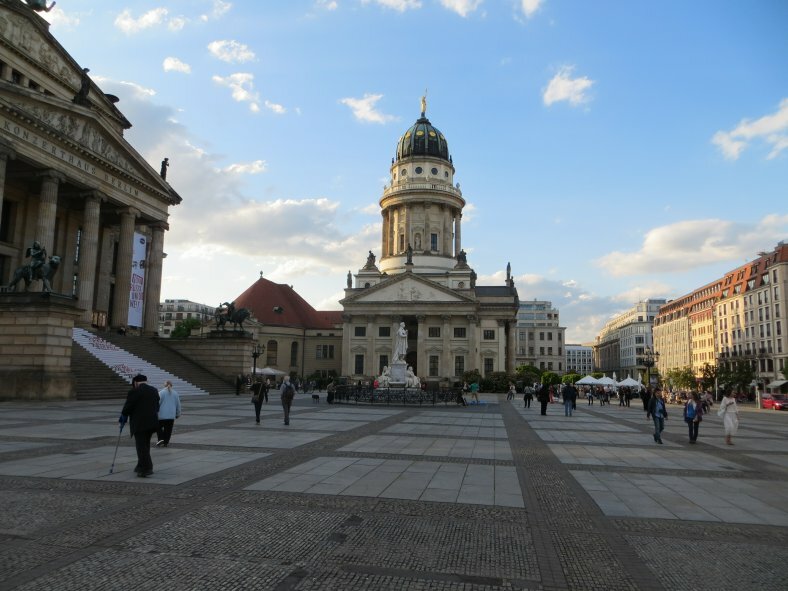 We moved on to Berlin’s finest square, the delightful Gendarmenmarkt. Frederick the Great, headquartered his royal guards here - Gens d’Armes (where the square gets its name). The French cathedral on the north end and its twin German cathedral on the south end are separated by a concert hall in the center of the square. 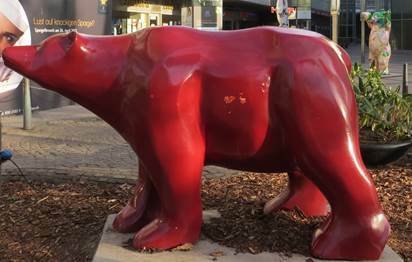 Going off on a tangent, as I told you, Berliners love currywurst and bears. See the bear holding the sausage on the roof? We had supper in a toilet. Literally. People stand in line to get what many consider Berlin’s best burger in this former public toilet. 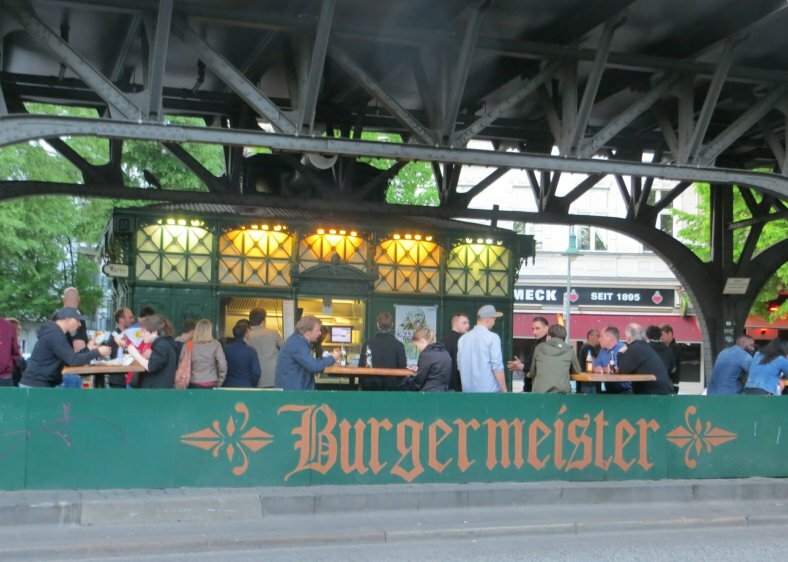 The Burgermeister is right under the train tracks where the U-Bahn trains pass over. The burger was quite good. 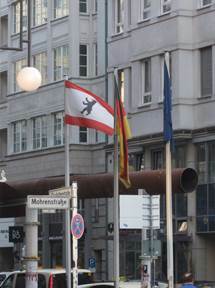 In answer to yesterday’s question, there is a bear on the Berlin flag which has led to bears becoming a symbol of Berlin. The little green guy, Ampelmännchen, was used on the old East German “Walk/Don’t Walk” traffic signals. After reunification they were to be replaced by more western signals. There was a big uproar causing them to be saved. The iconic character is now everywhere even with stores selling all kinds of items with his logo. Thursday was a day of shopping. We started out walking down past the Brandenburg Gate to Potsdamer Platz where we saw a mall the other day. On the way, we came across this installation. You can buy one of these guys (about the size of a garden gnome) for 50 euros. We walked through a section of the Berlin Wall entering the mall. 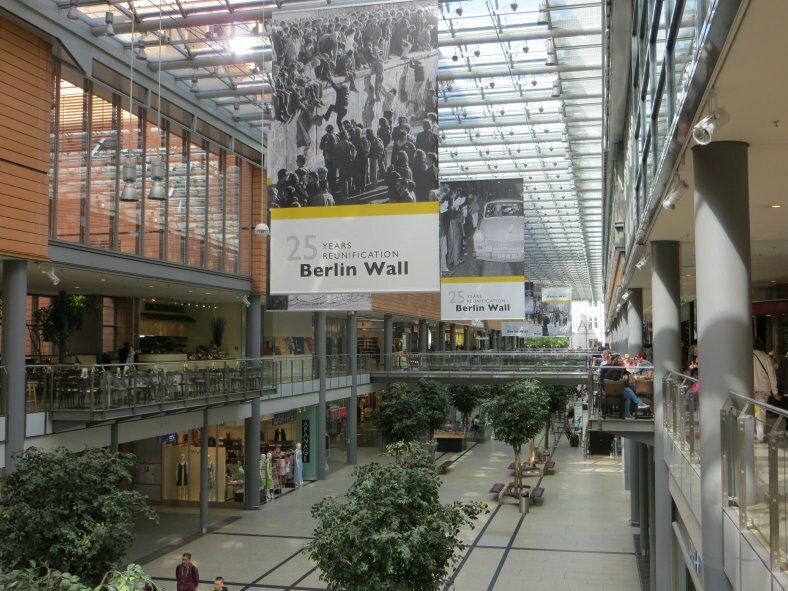 Notice the posters celebrating the 25th anniversary of German reunification. After leaving the mall, we took to a still-running U-Bahn train to get to Berlin’s biggest store, in fact second largest in all of Europe. 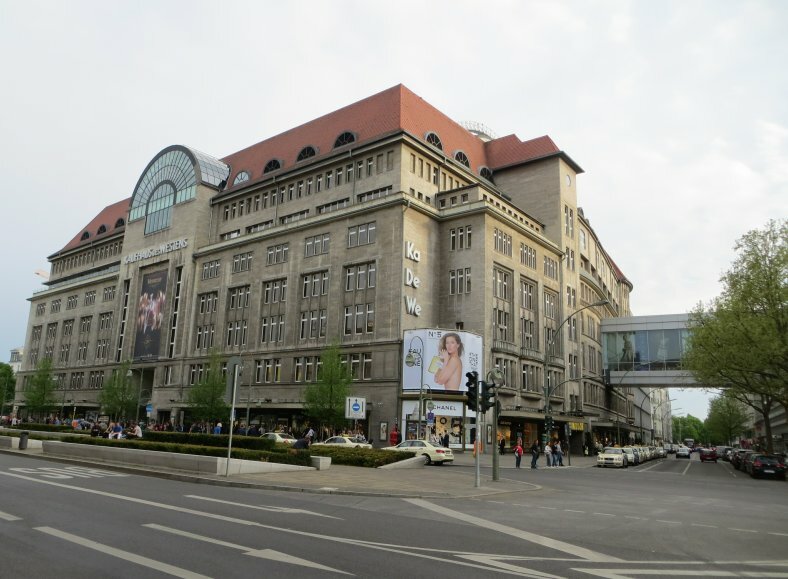 Kaufhaus des Westens (KaDeWe) department store has eight enormous floors. There were some reasonably priced items here but it’s mainly luxury goods. The 5th floor has home décor items. We saw a nice porcelain statue we could have purchased for our mantel or wherever with a price tag of over $21,000. The huge 7th floor food hall is called "Delicatessen" and is famous for its wide variety of food and beverages. It has around 110 cooks and 40 bakers and confectioners supplying more than 30 gourmet counters. The top floor has the Le Buffet 1000-seat restaurant offering views of Berlin. We didn’t buy anything here but it was really interesting going through this store even though photography wasn’t permitted. After our shopping we took the U-Bahn again to the opposite end of the city to a Turkish restaurant. A big block of meat (I think lamb) was roasting on a vertical rotisserie. Meat was shaved off; topped with tomato, onion and chili; then wrapped in a kind of flatbread. Simply delicious. Even the canned cola came from Turkey. Yesterday’s question was about the name Checkpoint “Charlie.” It has nothing to do with a person but the checkpoint's number. 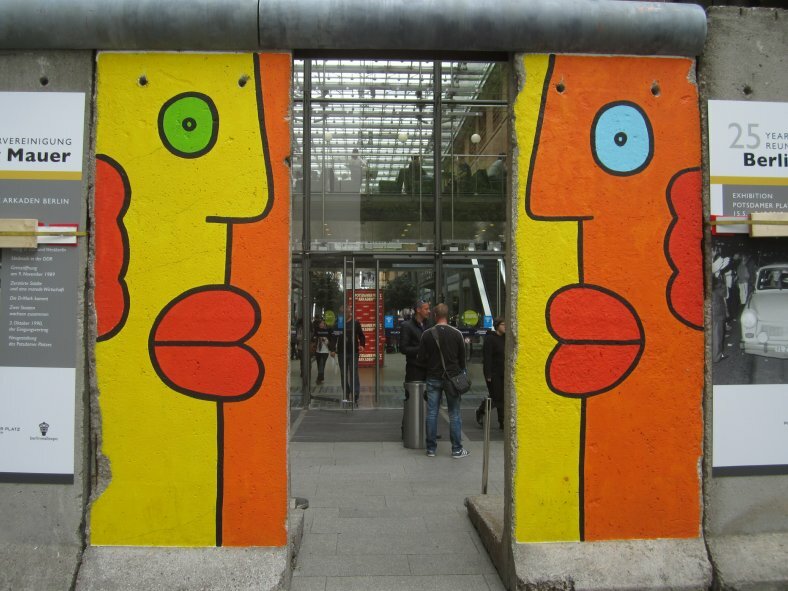 The first checkpoint, a hundred miles west of Berlin at the East-West German border, was labeled Alpha; the second, just as you come into Berlin, was called Bravo; this third checkpoint, where most foreigners passed through, was called Charlie. I mentioned that the KaDeWe department store was the second largest in Europe. What’s #1? 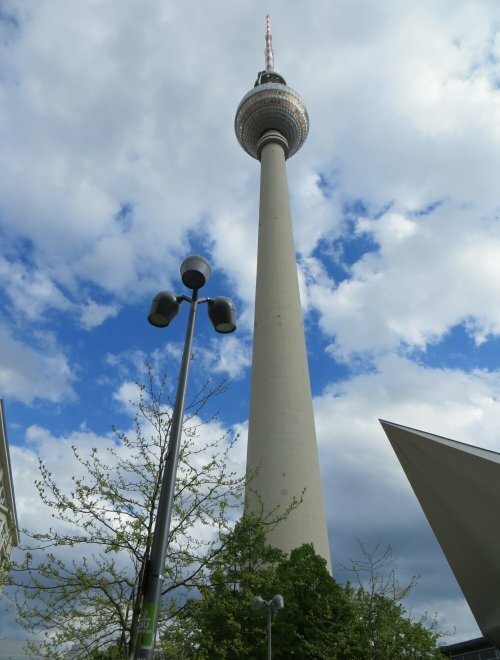 The video below is 32 minutes long of Dan & Kevin's five days in Berlin. The answer to the final question of Europe’s largest department store is Harrod’s in London. Several folks had multiple correct answers along the journey, but my brother Tim had the most correct answers. 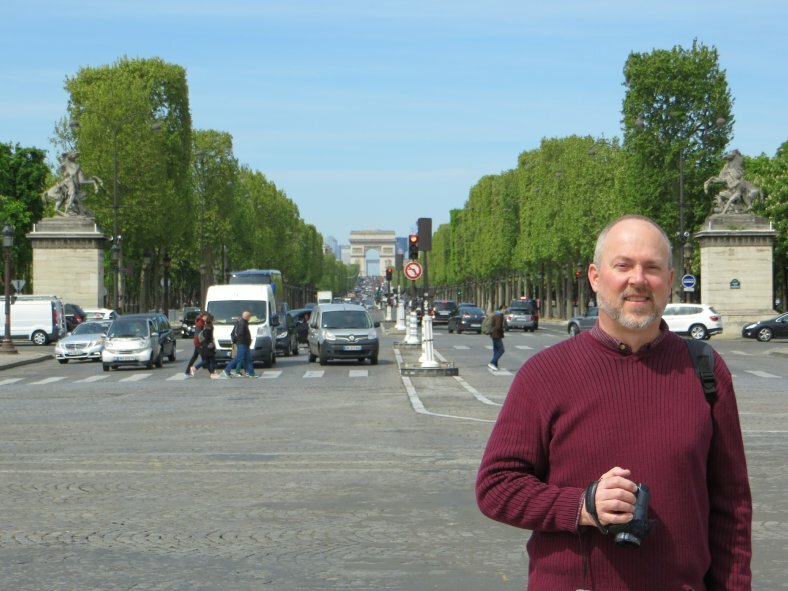 Speaking of Tim, very soon the videos of this trip will be posted on Tim’s YouTube channel (Hoosier Tim's Travel Videos) @ https://www.youtube.com/user/hoosiertim/. There are hundreds of travel videos there including our 2013 trip to Italy. As you know, doing this journal is a favorite part of the journey. Thanks for traveling along with us. About Me Current Picture of me and my home. Biography Pictorial biography of myself.